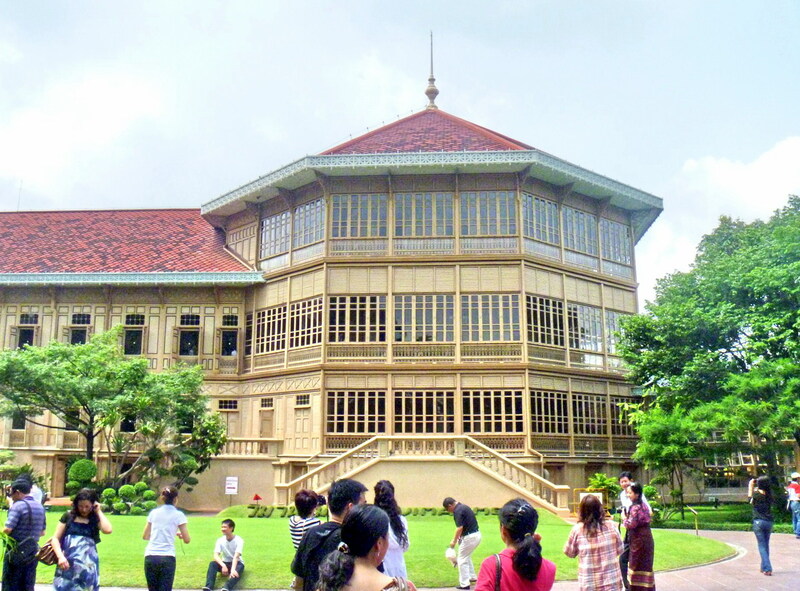 Included in the admission ticket to the Grand Palace was free entry to the Vimanmek Palace (also called the Vimanmek Teak Mansion), at the Dusit Palace Complex, and we next proceeded there. 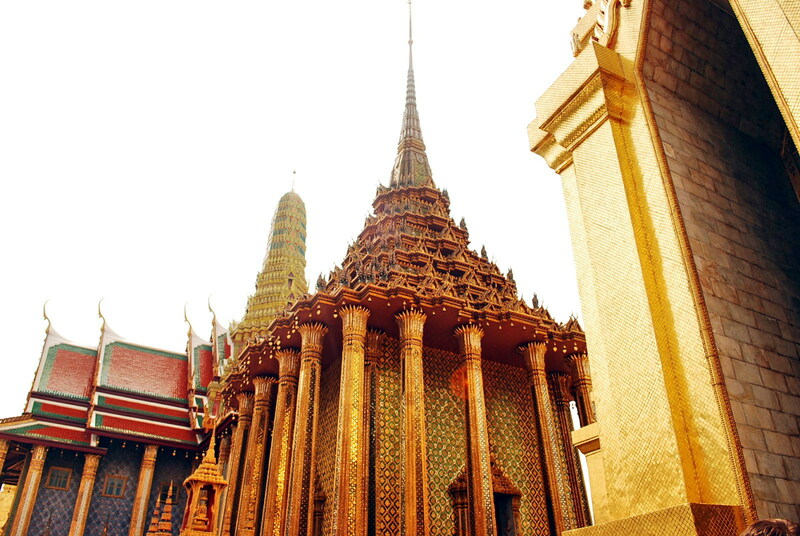 The world’s largest building made of golden teak, its elaborate style reflects a unique blend of Victorian and delicate Thai architecture. The mansion is one of 16 mansions or residential halls (out of 20) in the complex that can be visited by tourists. 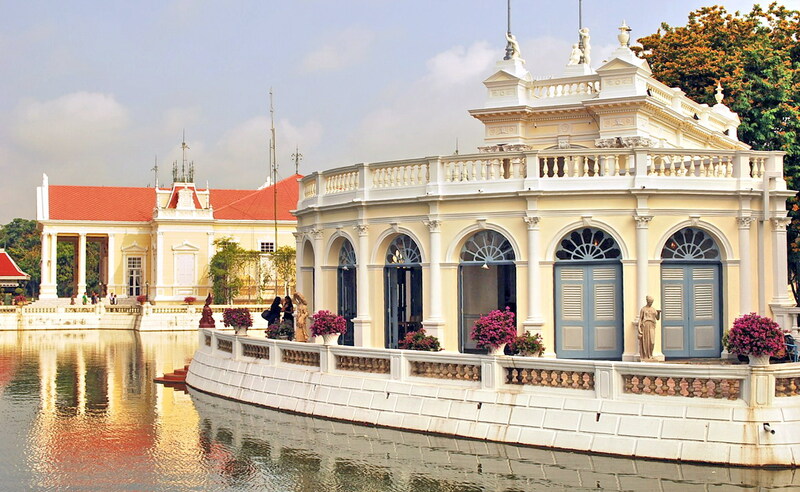 A former royal palace, it was built in 1900 by King Chulalongkorn (King Rama V, 1868-1910), a few years after his return from Europe in 1897, using his personal money to purchase orchards and paddy fields between Padung Krungkasem Canal and Samsen Canal for the construction of a royal garden which he named the Dusit Garden. Vimanmek Mansion was the first permanent residence there. Upon its completion, King Rama V then transferred here from the Grand Palace and stayed for 5 years until the completion of Amporn Satan Residence in 1906 (where he live until his death). 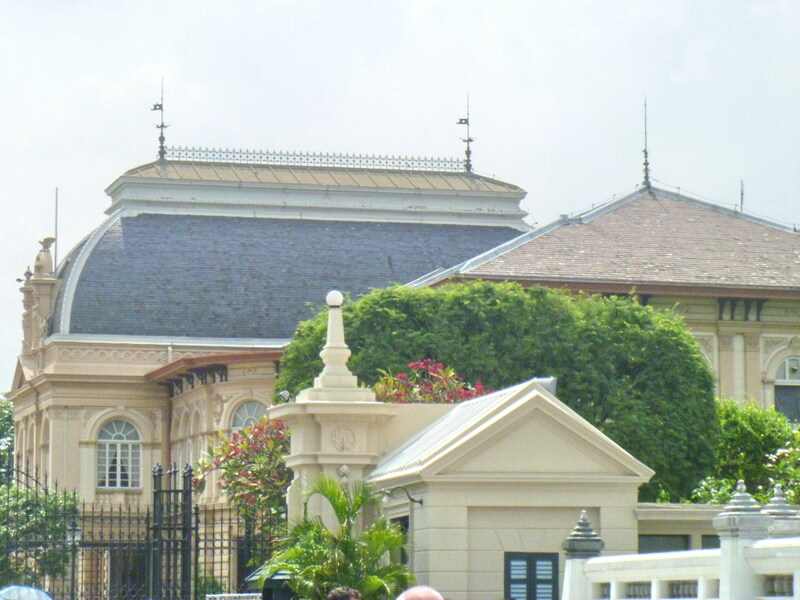 Vimanmek Mansion was then closed down and members of the royal family moved back to the Grand Palace. In 1982, it was renovated and converted into a museum. This 72-room building has 2 right-angled wings, each 60 m. long and 20 m. wide. It is 3-storeyed except for the octagonal part, where King Rama V resided, which has 4 storeys. Although the ground floor is brick and cement, the upper floors are made with beautiful golden teakwood. Before touring, we had to put all our belongings in a locker (same as in the Jim Thompson House). It was also a shame we can’t take photos inside. Before entering, we also had to remove our shoes and wait our turn. 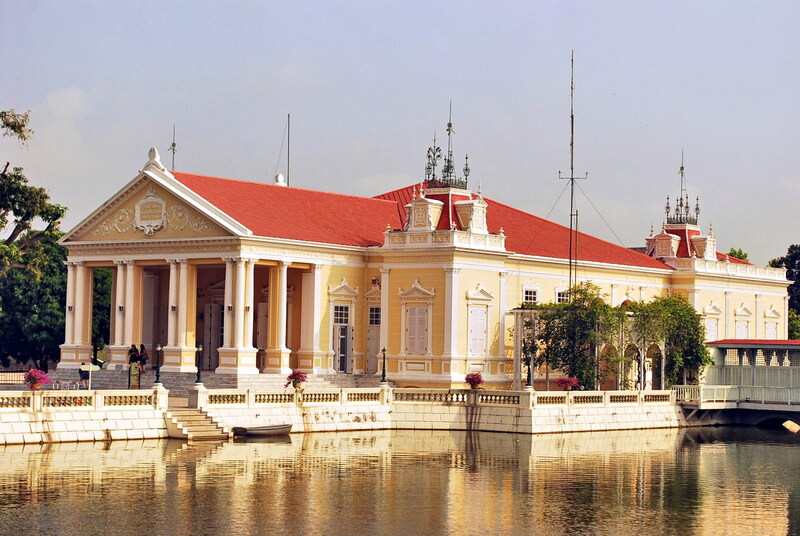 The mansion was a veritable museum that displays the king’s photographs, art and artifacts that commemorate his royal visit to Europe. We also viewed an exhibit of Thai handicrafts in 31 exhibition rooms, some of which maintain the atmosphere of the past, especially the bedrooms, the Audience Chamber and the bathrooms. Some rooms display silverware, ceramics, glassware and ivory. 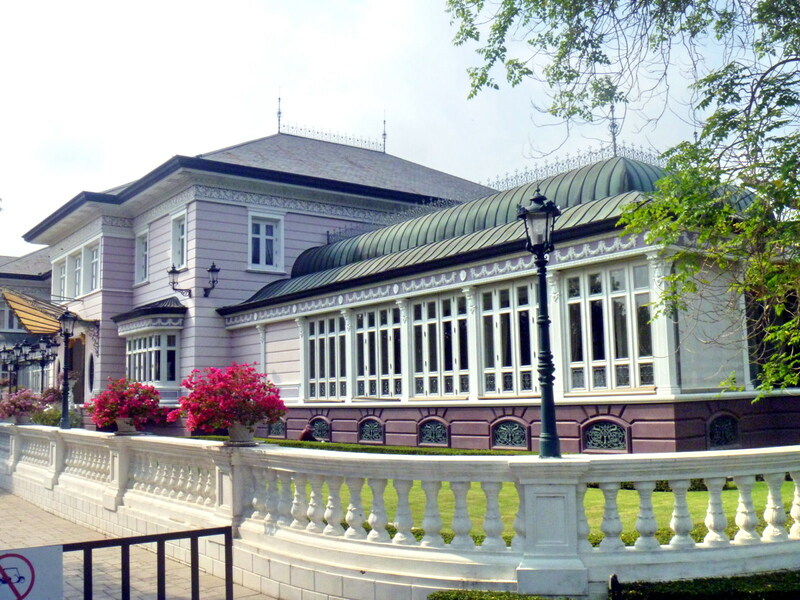 Vinanmek Mansion: Ratchawithi Rd., Dusit, Bangkok, Thailand. Tel: +66 2 628 6300 Ext. 5120-5121. Fax: +66 2 628 6300 Ext. 5136. Website: www.vinanmek.com. On our third day in Bangkok, we availed of a tour from the travel agency at the hotel, of the fabulous Grand Palace (Phra Borom Maha Ratcha Wang), the gem of Bangkok’s impressive collection of temples and palaces, and its adjoining Wat Phra Kaew (Chapel Royal of the Emerald Buddha), Thailand’s most important temple. This would the first for Jandy and Cheska. After breakfast at the hotel, we were picked up at the hotel lobby by a good English-speaking guide (he seemed to be of Indian ancestry) and driven to the palace in a sedan. 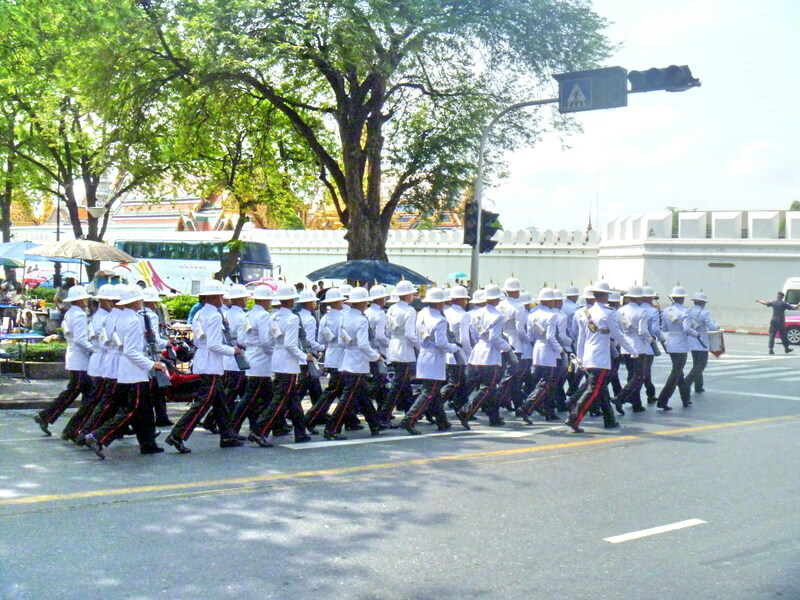 We arrived at the palace just when a troop of marching soldiers, dressed in colorful ceremonial uniforms, were entering the gate along Na Phra Lan Road, on the north side, to the palace’s Outer Court and we followed at their heels. The weather was sunny but extremely hot. 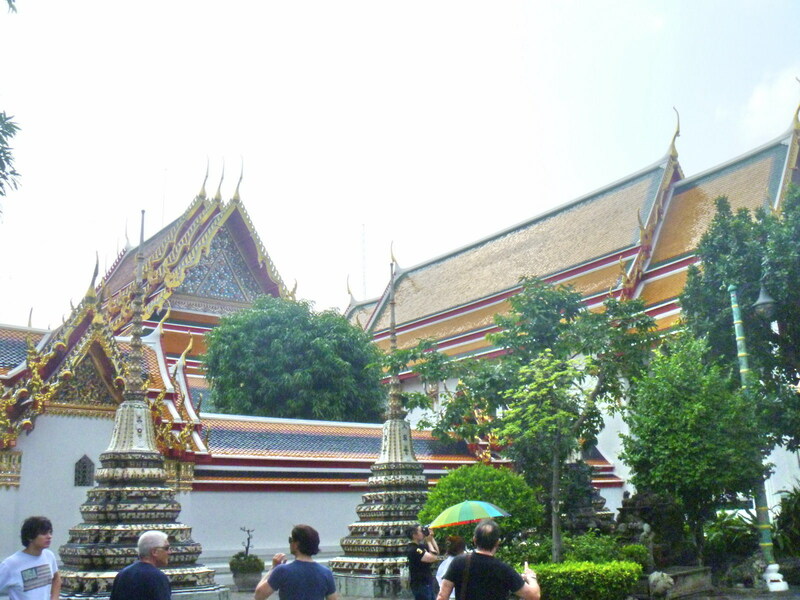 Whether you take a guided tour or not, the route through the complex is more or less fixed, with the Wat Phra Kaeo first and the Grand Palace last. Nowadays, the Grand Palace, the official residence of the king of Thailand from the 18th century to the mid-20th century, is used only for occasional ceremonial purposes and is no longer the royal residence as King Bhumibol (Rama IX) lives in Chitralada Palace (closed to tourists) which is located not too far away in Bangkok’s Dusit district, near Dusit Zoo. 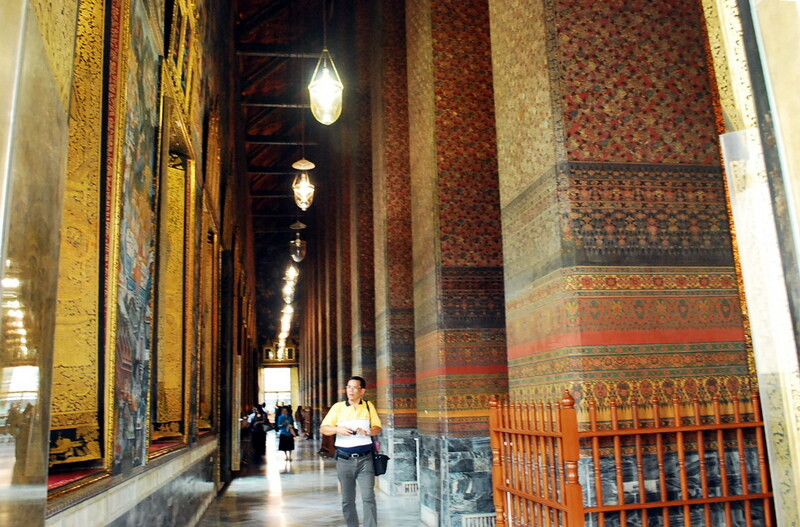 However, the interiors of most of the buildings in the Grand Palace remain closed to the public. 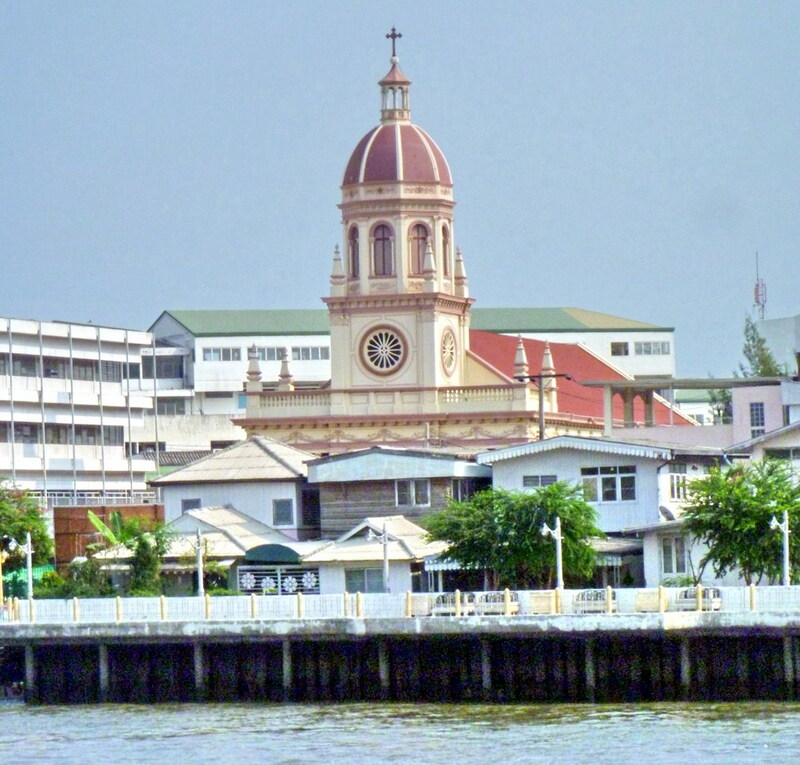 Sitting on the eastern bank of the Chao Phraya River, this complex of of shrines, temples, royal halls and apartment buildings, despite their proximity, have a distinct contrast in style, the Grand Palace being European-inspired in architecture (the roof being the exception) and the Wat Phra Kaew very Thai. It covers 218,400 sq.m. and is surrounded by a 1,900 m. long wall. 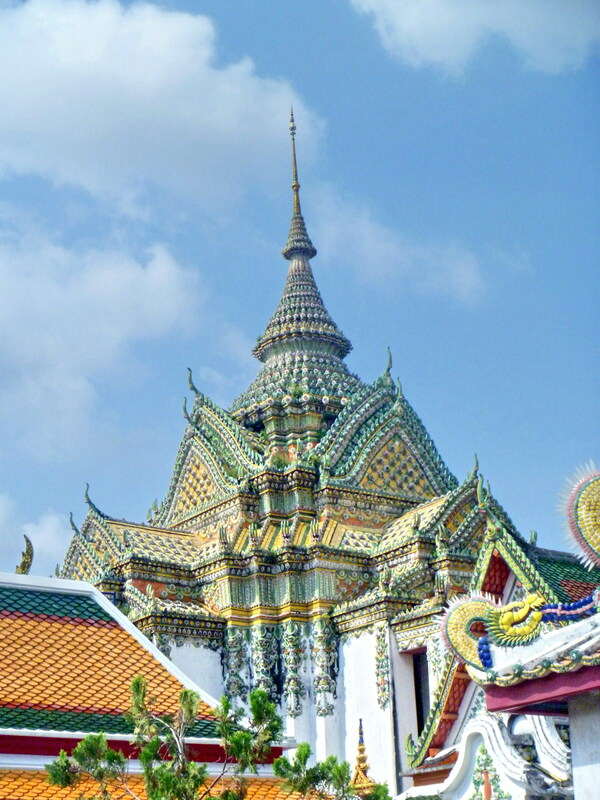 The 94.5-hectare (234-acre) Wat Phra Kaeo, built in 1782 during the reign of King Rama I, has a roof embellished with polished orange and green tiles, pillars inlaid in mosaic and pediments made of rich marble. 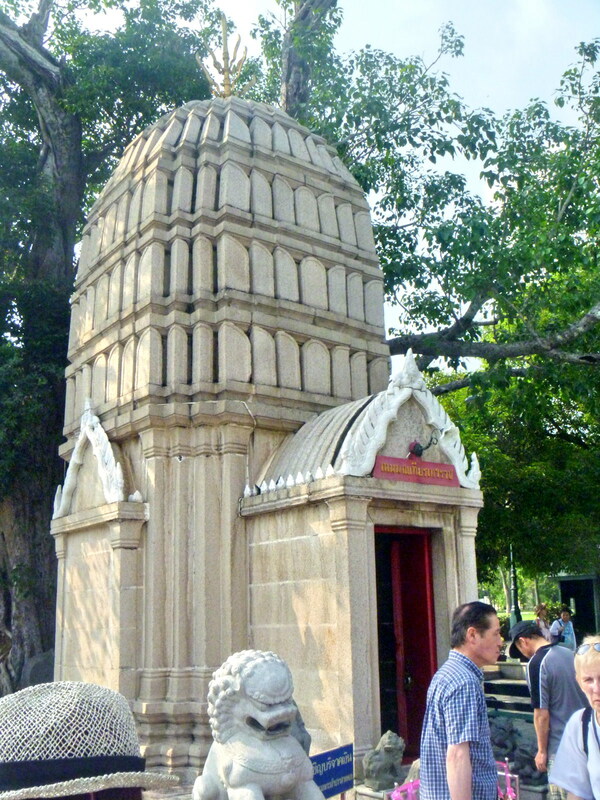 The temple houses the small (45 cm. tall), beautiful, gold-clothed and greatly revered Emerald Buddha, carved from a block of fine green jade (instead of emerald) sitting on a high throne under a golden filigree canopy. As in all Thai temples, we were required to remove our shoes or sandals before entering. Bare feet are not allowed either. We also weren’t allowed to take pictures inside. In the middle of the complex is the Phra Mondop, a library built in Thai style by Rama I. It houses elegantly carved, Ayutthaya-style mother-of-pearl doors, bookcases with the tripitaka (sacred Buddhist manuscripts), human-and dragon-headed nagas (snakes), and images of Chakri kings. Enclosing this temple complex are galleries with typically Thai murals that feature lovely paintings depicting 178 unbelievably vivid and detailed scenes from the Indian epic Ramayama (Ramakien in Thai) that show the heroic tale of Rama of Ayodhya and his war against the giant Ravana, king of Lonka. The Upper Terrace has 4 main monuments: the Phra Sri Rattana Chedi, the Repository of the Canon of Buddhism, the Prasart Phra Dedidorn (the model of Cambodia’s Angkor Wat presented to King Mongkut) and the Prasat Phra Thep Bidon. The Phra Sri Ratana Chedi, located west of Wat Phra Kaeo, is a 19th century stupa built in Sri Lankan style. It enshrines the ashes of the Buddha. The Prasat Phra Thep Bidon (Royal Pantheon), crowned with a high filigree prang, contains the relics of the previous kings of the Chakri Dynasty. It has lovely kinnara (half man, half bird) statues up front. 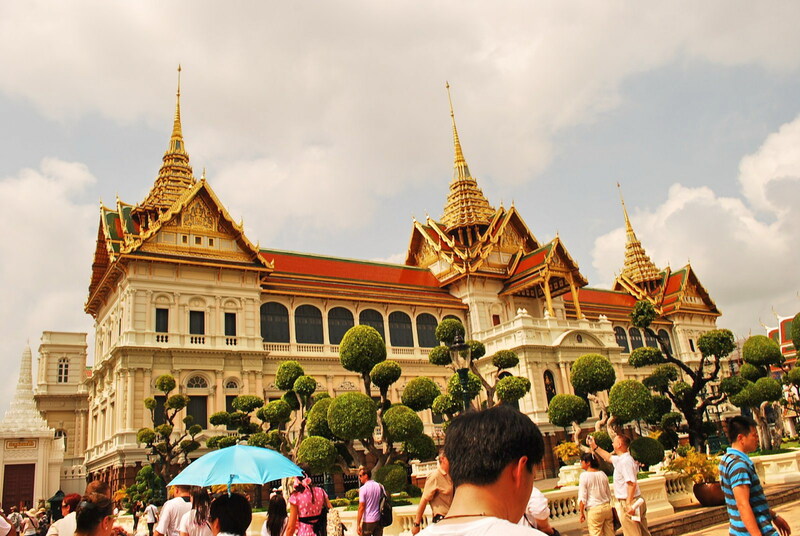 The Grand Palace has two groups of residences: the Chakri Maha Prasat Hall and the Phra Maha Monthian. The Italian Renaissance-influenced Chakri Maha Prasat Hall, built in 1882 by King Chulalongkorn (Rama V), is a remarkable mixture of European and traditional Thai styles. Each wing has a shrine (mandap) crowned by a spire and has 3 prangs instead of domes. This palace houses elegant staterooms and an exhibition of the royal weapons collection at the ground floor. 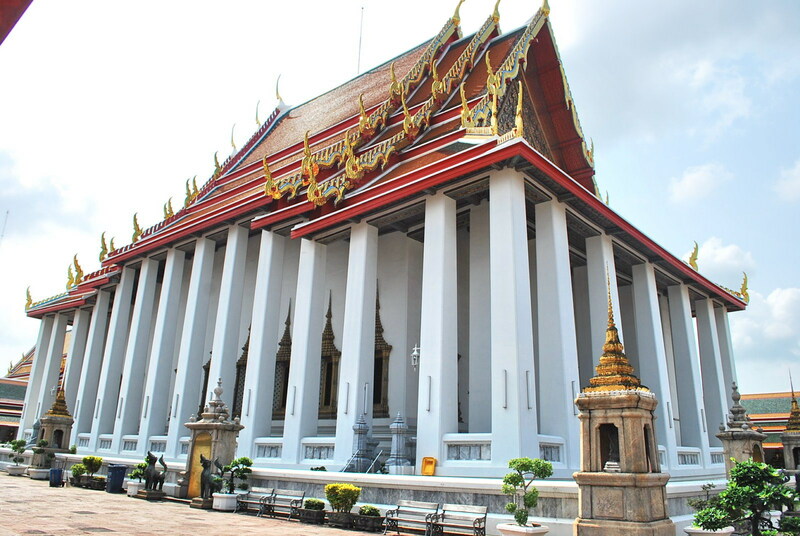 The Phra Maha Monthian consists of the Amarin Winitchai Audience Hall and the Paisal Taksin Hall which features the monarchy’s coronation chair. 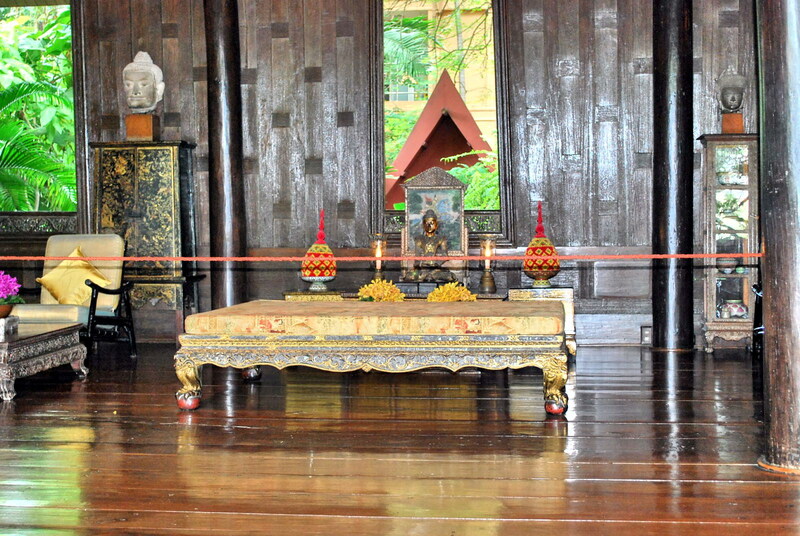 The Amarin Winitchai Audience Hall was where court ceremonies took place before the throne. It has a very interesting 4-tiered roof and a very pretty pavilion in front of it (Amporn Phimok Prasad). At the eastern end is the Borombhiman Hall, built in the French architectural style. 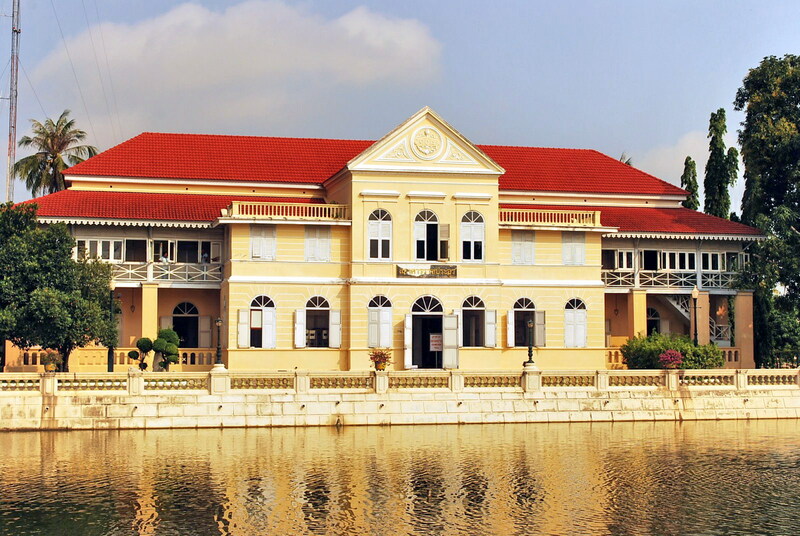 Formerly the residence of King Rama VI, it is now used as guest house for visiting foreign dignitaries. 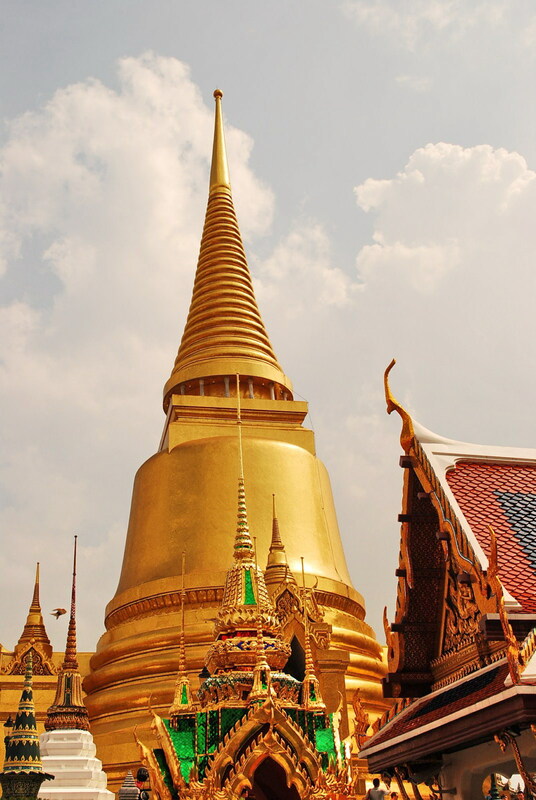 Grand Palace and Wat Phra Kaew: Open daily, 8:30 AM-4:30 PM. 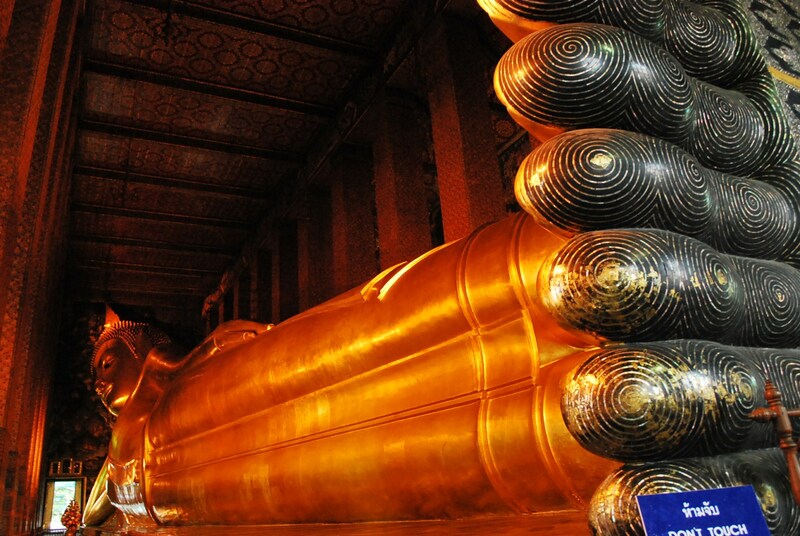 How to Get There: take bus 44, 47 and 91 and drop off at Thaiwang Road, between Wat Pho and Wat Phra Kaew. You can also take bus 1, 25, 44, 47, 82 and 91 and drop off at Maharat Road, west of Wat Phra Kaew. North of Wat Phra Kaew, on nearby Sanam Luang, you can also take bus 3, 15, 30, 32, 43, 44, 59, 64, 70, 80, 123 and 201 as well as airconditioned bus 6, 7, 12, 39 and 44. The Tha Chang river express boat stop is also very near. From the ruins at the Ayutthaya Historical Park, we moved on to the Wat Phra Mongkhon Bophit, southwest of Phra Si Sanphet and south of the Royal Palace ruins. As with any temple visit, we were required to remove our shoes. What is remarkable here is the gigantic Phra Mongkhon Bophit (Buddha of the Holy and Supremely Auspicious Reverence), the Ayutthaya bronze Buddha installed in the viharn. 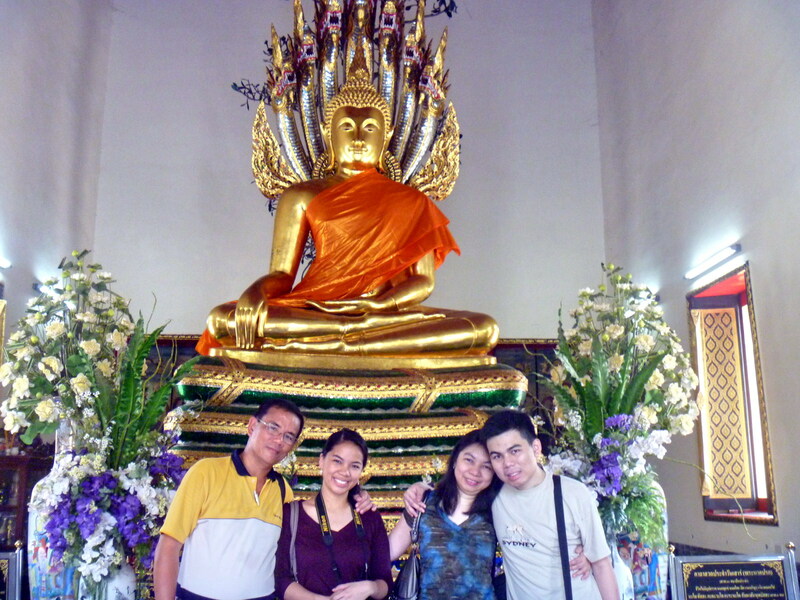 It is similar to the Ayutthaya-style bronze Buddha in Wat Phanan Choeng at the southeast corner of old Ayutthaya. The bronze Buddha, one of the largest in Thailand, was sculpted in 1538 during the reign of King Chairacha (r. 1534-1547) at Wat Chi Chiang Sai. 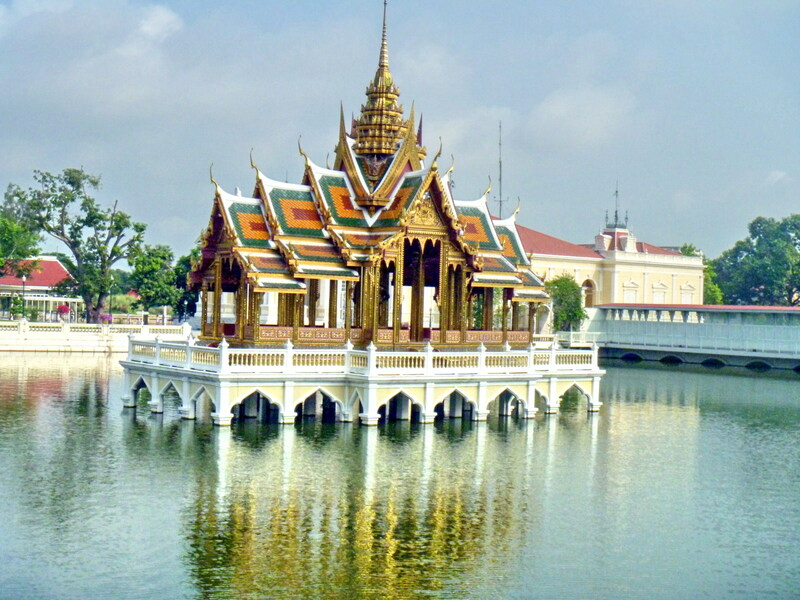 It had previously been damaged by lightning and was restored in the Rama V period. The vihara building we see today was rebuilt during the rule of Field Marshal Phibunsongkhram in the early 20th century.” Its Buddha was previously enshrine in a mandapa (square-roofed structure). However, during the reign of King Sua (r. 1703-1709), it was recorded that when lightning struck the spire of this building, the roof caved in and the bronze head broke off. King Sua had the mandapa demolished and a new tall preaching hall built. 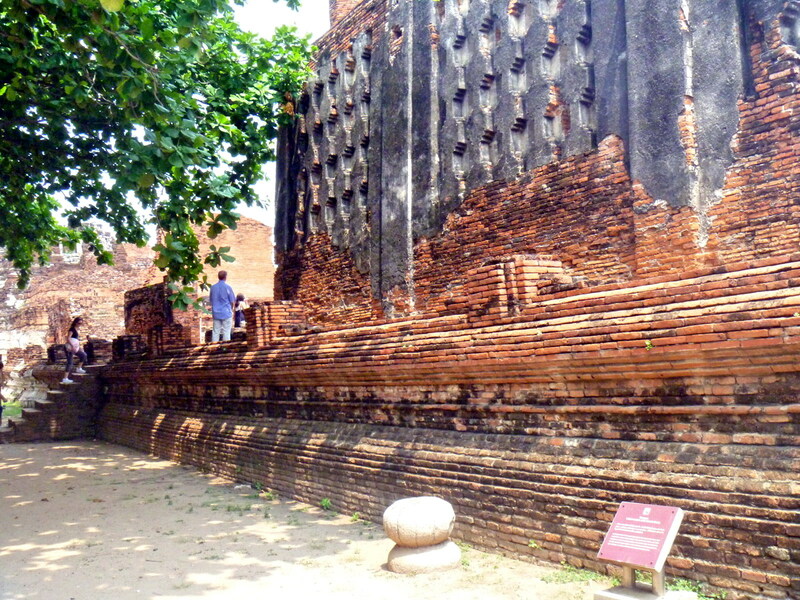 The vihara and the image were badly destroyed by fire during the fall of Ayutthaya in April 1767. The roof of the vihara was damaged and the head and the right arm of the image were broken. In 1920, the broken head and right arm were repaired by Phraya Boran Rachathanin during the reign of King Rama VI. 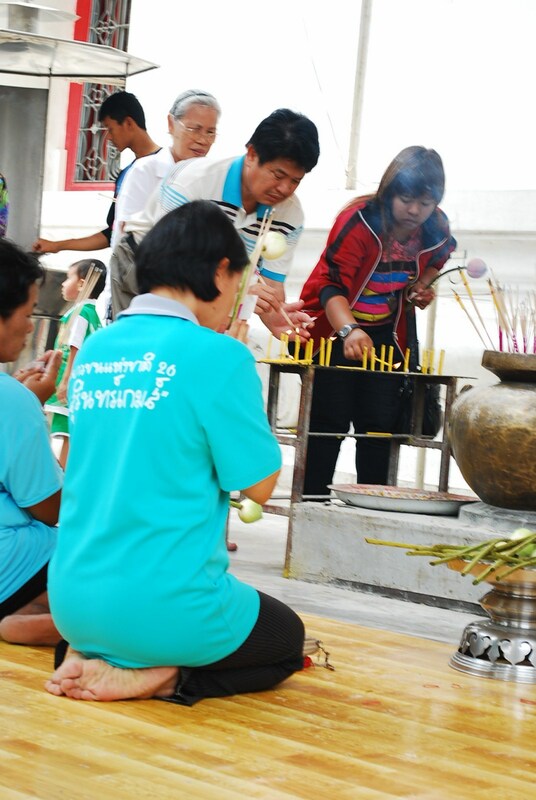 In 1931, another restoration took place with the financial support of Khunying Amares Sombat. During restoration works on the statue in 1955, a quantity of Buddha images were found on the left shoulder of Phra Mongkhon Bophit. 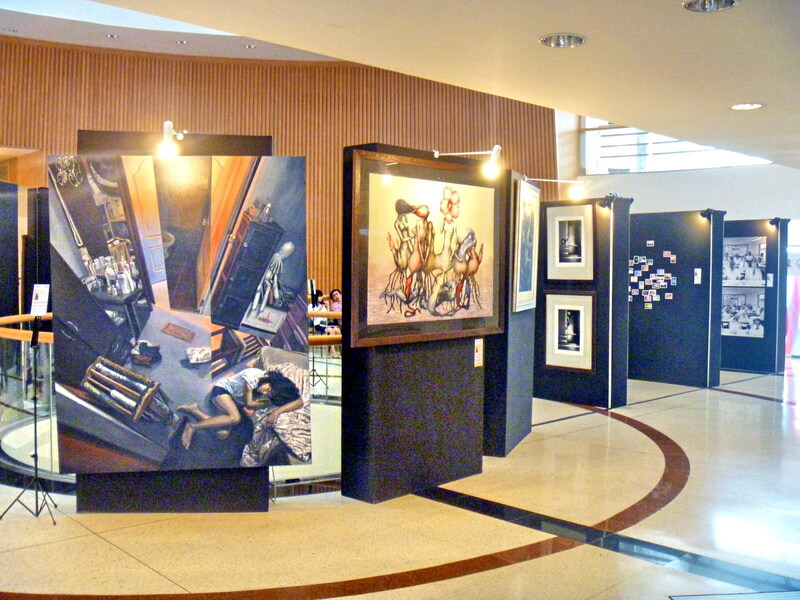 These images can now be seen at the Chao Sam Phraya National Museum. The Prime Minister of Burma on official visit in Ayutthaya in 1956 gave a donation for the restoration of the vihara. The vihara was finalised in 1957, but not with the same beautiful craftsmanship of the former one. 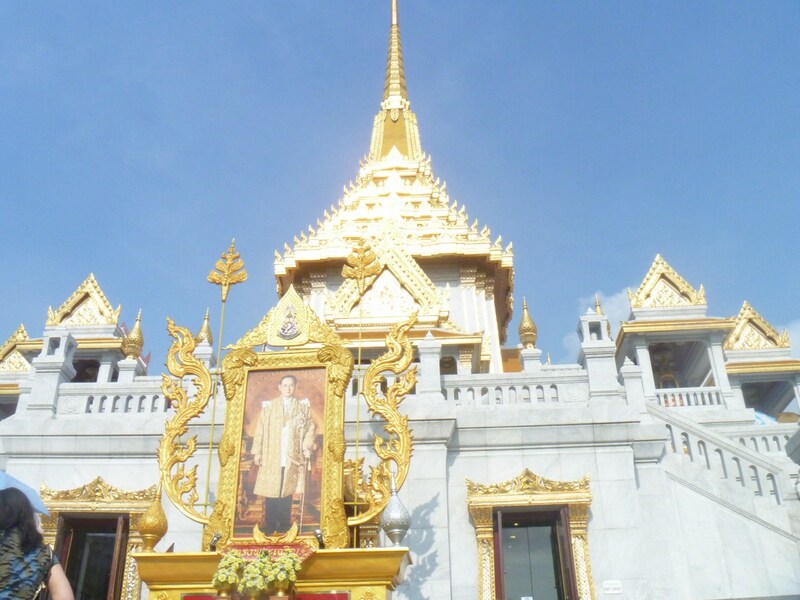 The statue of Phra Mongkhon Bophit was covered with gold leaf in 1992 by the Mongkhon Bophit Foundation, in celebration of the 60th birthday of H.M. Queen Sirikit. 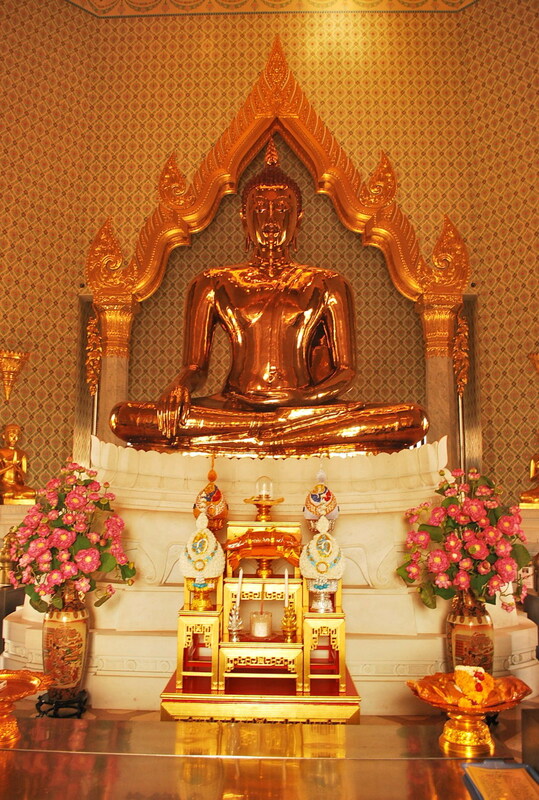 The Phra Mongkhon Bophit, seated in the position of Subduing Mara, measures about 9.5 m. across the lap and a height of 12.5 m. (without the pedestal). 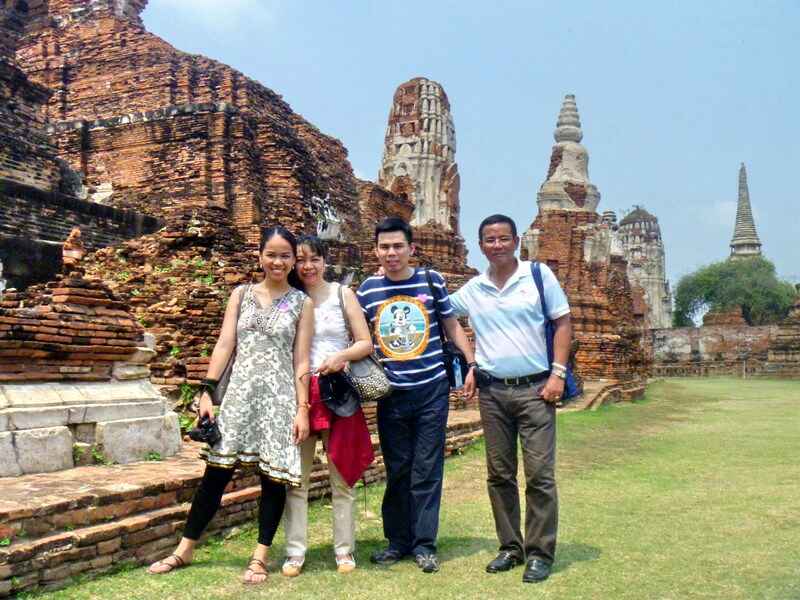 From Bang Pa-in Palace, our tourist bus next traveled, 10 kms., to the very heart of the city of Ayutthaya. Here, we dropped off at Wat Mahathat (Temple of the Great Relics) in Ayutthaya World Heritage Historical Park, perhaps the most striking of all of the temples in the city. Wat Mahathat was said to have been built in 1384 by King Rachatirat as a symbolic center to enshrine a relic of the Buddha although others say it was more likely built during the reign of King Boromaraja I (1370-88). The temple was also the residence of the Sangaraja, the Supreme Patriarch or leader of the Kamavasi (City Dwelling) sect of Thai Buddhist monks. 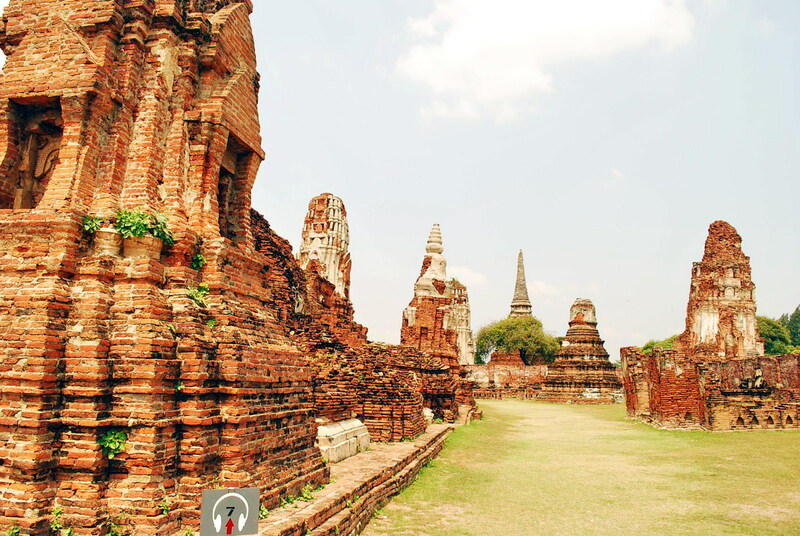 During the fall of Ayutthaya in 1767, Wat Mahathat was set on fire by Burmese invaders. The monastery was restored and remodeled many times in the later Ayutthaya period, until it finally collapsed on May 25, 1904. Only the symmetrical laterite base of the main prang (Khmer-style tower), with staircases on the 4 sides, and some of its upper structure remains. There are rows of headless Buddhas and traces of rows of columns that once supported the roof structure of the verandah that enclosed the chedi. 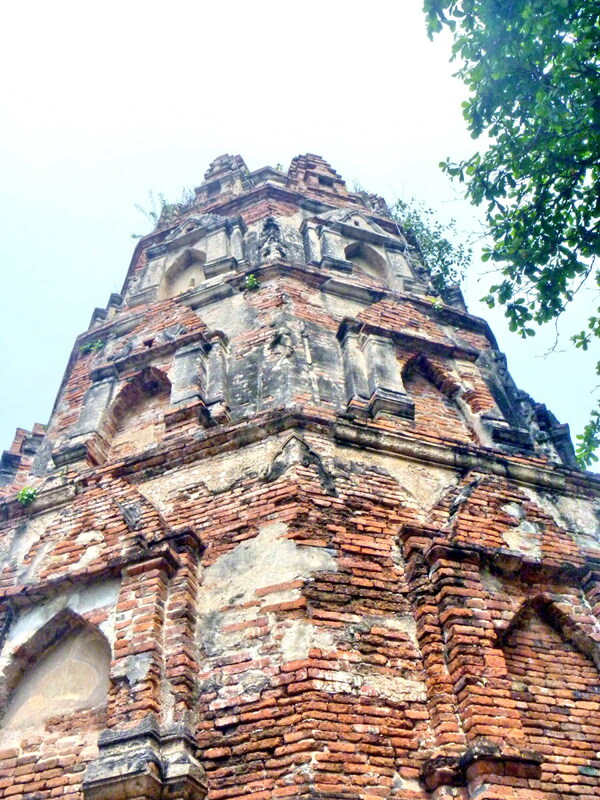 Scattered around the temple are some important remains of variously-shaped prangs and chedis, in particular an octagonal chedi with a truncated spire in the Ceylonese style. Nearby, the head of a still much-revered statue of the Buddha lies on the ground. 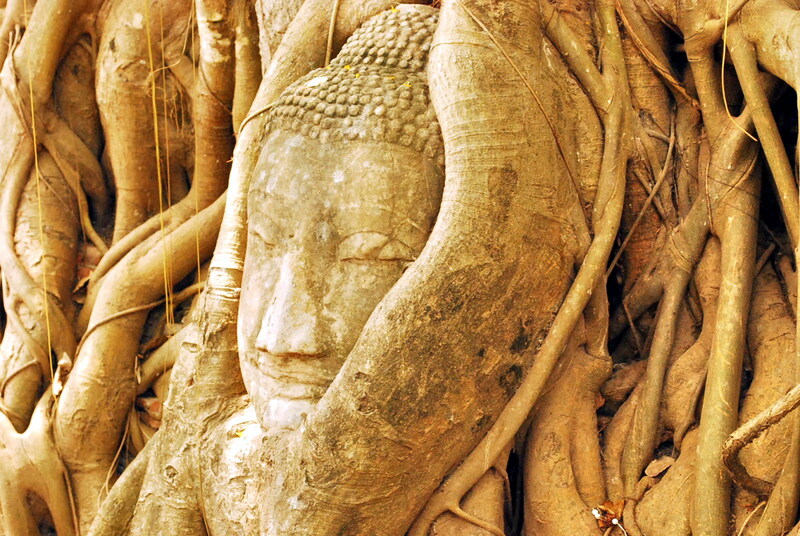 The much photographed stone head of one Buddha is entwined in the roots of a Banyan tree. Although only partially restored, the existing ruins are still vast and imposing, giving us an insight into what was once a most important religious center. 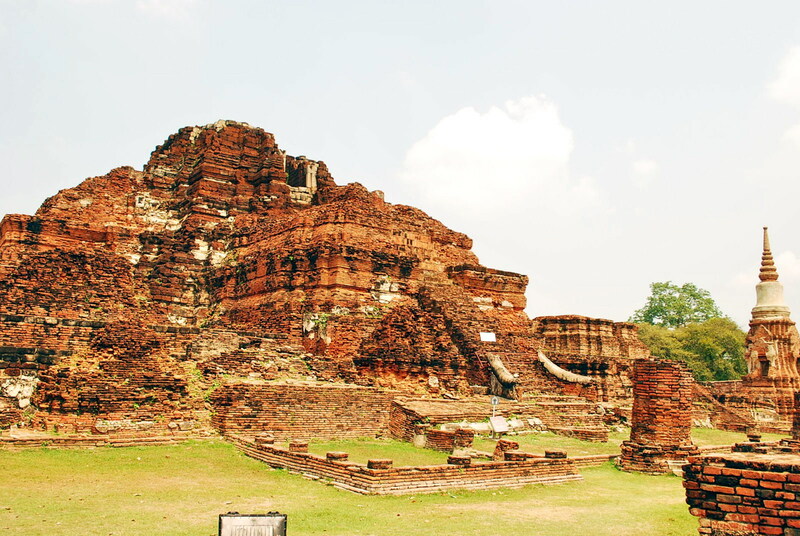 As in most architecture of the early period of Ayutthaya, Wat Maha That consisted basically of a large, 46 m. (150 ft. ) high central prang surrounded by 4 subsidiary prangs at the 4 inter-cardinal points, standing on a raised square platform. Around 1625, the top portion of the main central prang collapsed, but was restored and heightened by some 4 m. (13 ft.) in 1633. In 1911, the main prang collapsed again and only the foundation of the main prang remains at present. 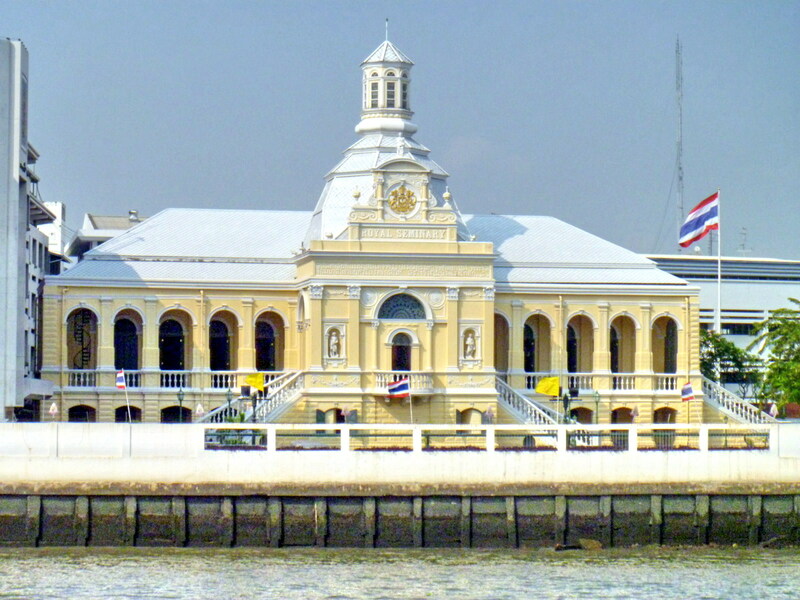 East of the main prang is the rectangular, 40 m. by 20 m. Wihan Luang (Royal Assembly Hall), orientated towards Khlong Pratu Khao Pluak. The vihara had a front porch (east) which could be reached by 3 staircases. There was also an entry into the hall from both sides. Behind the main pedestal were two exits leading down to the gallery. The multi-tiered roof of the viharn was supported by 2 rows of columns. The hall contained mural paintings of the Vessantara Jataka. 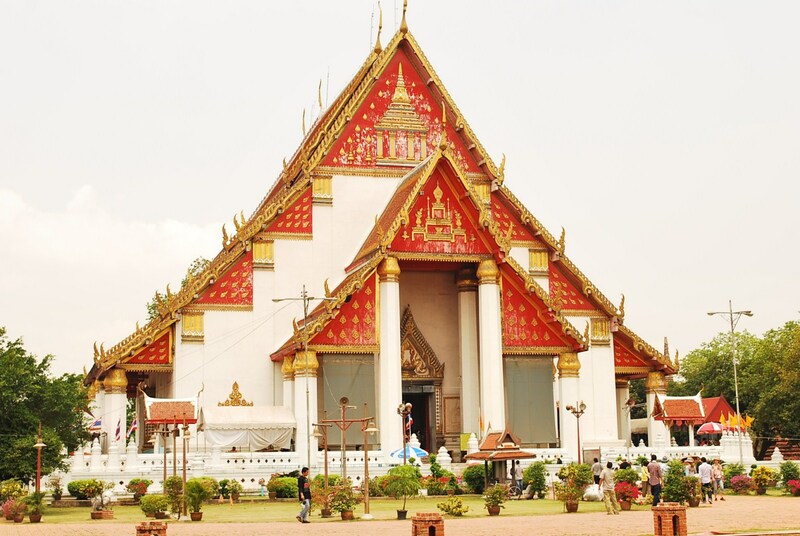 Wihan Luang has undergone several restorations in the past as well as in recent times. 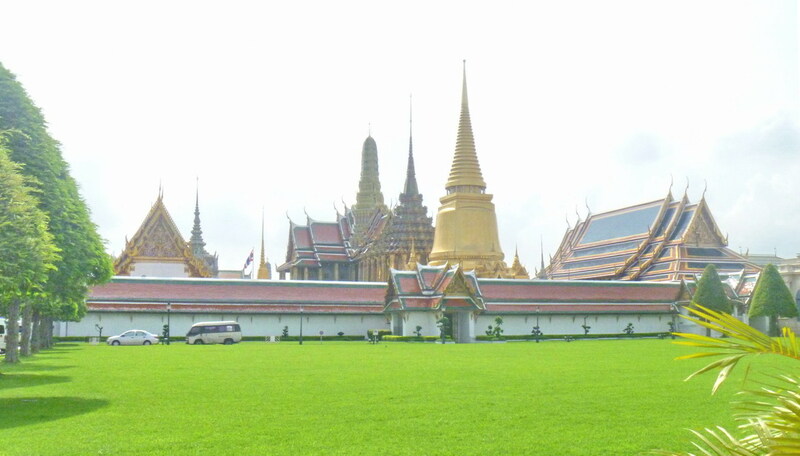 West of the main prang is the rectangular Phra Ubosot (Ordination Hall). The hall had a double entry to the west and two exits on the sides, near the main pedestal which contained the presiding Buddha image. The hall was surrounded by an inner wall called kamphaeng kaew (literally “crystal wall”), forming an inner court which gave access to the, gallery. Outside and around the ubosot were 8 boundary stones or marker slabs (bai sema) at the 8 cardinal points in order to demarcate the sacred area of the Sangkha (Buddhist brotherhood). In 1956, a secret chamber was uncovered in the ruins; among the treasures found inside were a solid gold lion sitting in a fish-shaped container decorated with a gilded motif and filled with other gold accessories, gold jewelry, a gold casket containing a relic of the Buddha, and fine tableware. Wat Mahathat: cor. Chikun Road and Naresuan Road, Tha Wasukri sub-district, Ayutthaya, Thailand. On our second day in Thailand, we decide to go out of the city and visit the old Thai capital of Ayutthaya, a UNESCO World Heritage Site. We made our travel arrangements with a travel agency based near our hotel lobby at the ground floor. The 60-km. trip, via an airconditioned tourist bus, took just 1 hr. 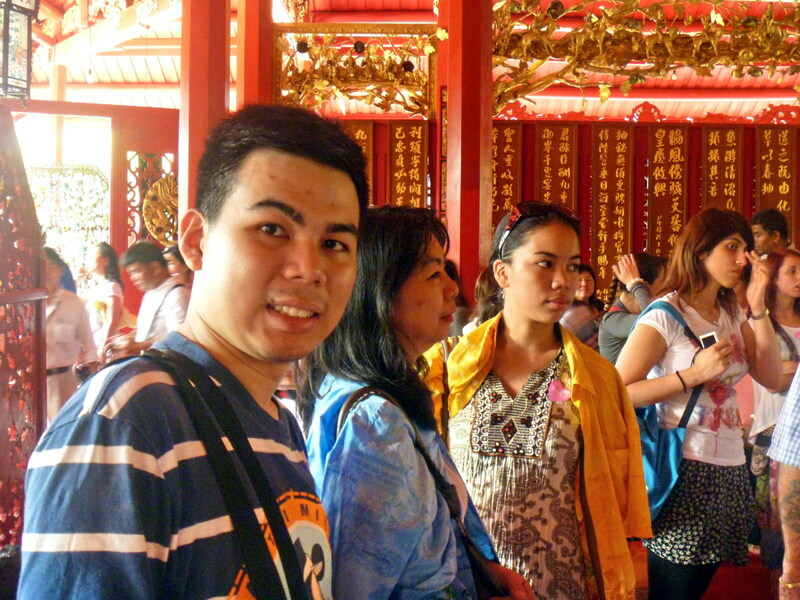 Our first stop, upon reaching Ayutthaya, was the Bang Pa-In Royal Palace, also known as the Summer Palace. This palace complex, located along the bank of the Chao Phraya River, was originally constructed by King Prasat Thong in 1632 but, after the sack of Ayutthaya in 1767, it lay empty and overgrown throughout the late 18th century and early 19th century. 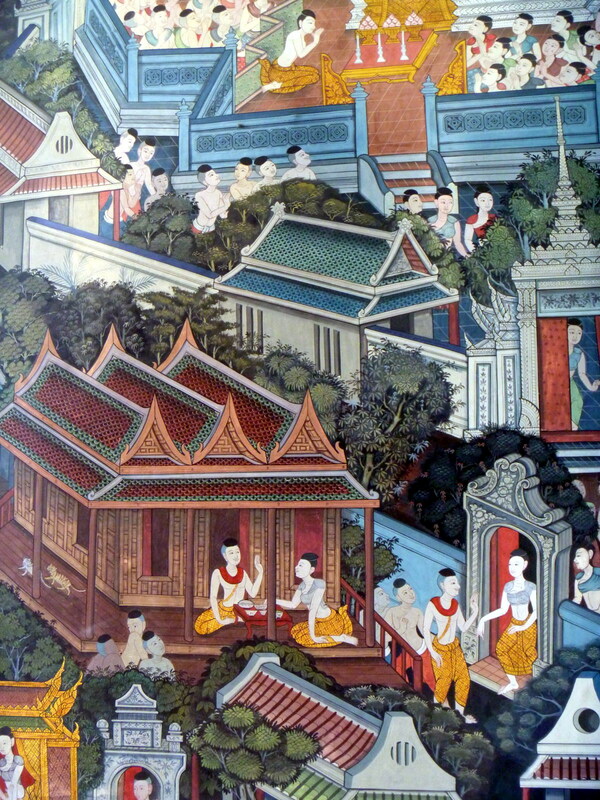 King Mongkut (Rama IV) began to partially restore the site in the 1850s. Most of the present European-style buildings were constructed between 1872 and 1889 by King Chulalongkorn (Rama V). Today, the palace remains largely open to visitors, as King Bhumibol Adulyadej and his family uses it only rarely for banquets and special occasions. However, as at all royal sites, proper dress was required and Grace and Cheska had to rent colored polo shirts to cover their shoulders. The grounds are not too large to be covered on foot. 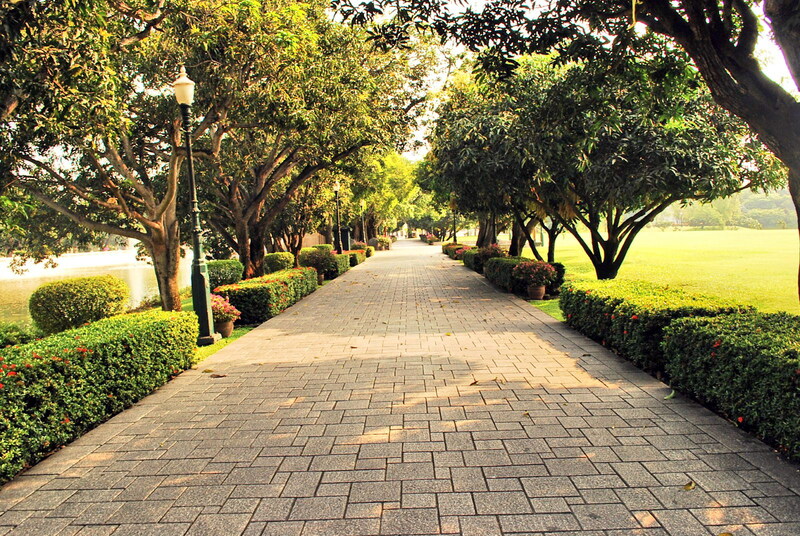 From the entrance, we walked along a formal entry promenade. The buildings, very European in design, are laid out along a long rectangular, artificial and ornamental lake lined with formal landscaping. The lake serves to divide the “public” outer area of the palace from the inner private areas. Along the route, we passed the Ho Haem Montien Devaraj (Golden Palace of the God King) or King Pasart Thong Shrine. This Khmer-style, stone prasat (residence of a king or god with a corncob-shaped super-structure ), under a banyan tree, was built by King Rama V in 1879 to replace an old shrine built by villagers as an offering to King Prasart Thong of the Ayutthaya period. 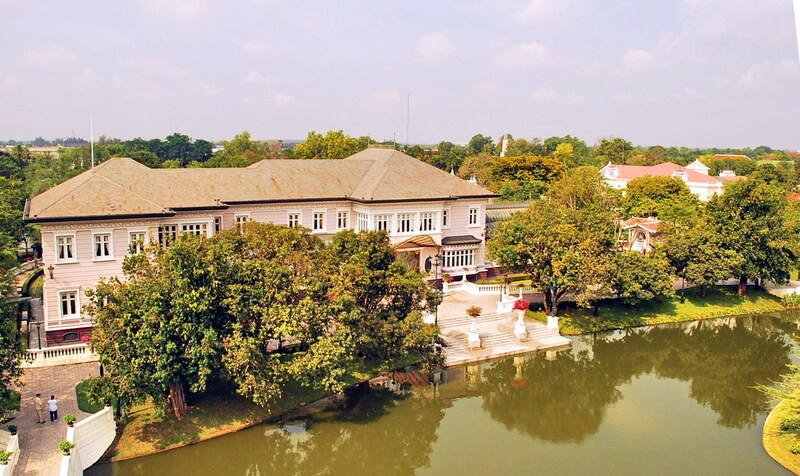 On the left bank of the lake is the colonial-style, 1-storey, Neo-Classical style Saphakhan Ratchaprayun (Exhibition Hall). Originally built for the King’s brothers, it now houses a small museum covering the history of the palace. The one-storey Warophat Phiman (Excellent and Shining Heavenly Abode) was King Chulalongkorn’s residence and throne hall. 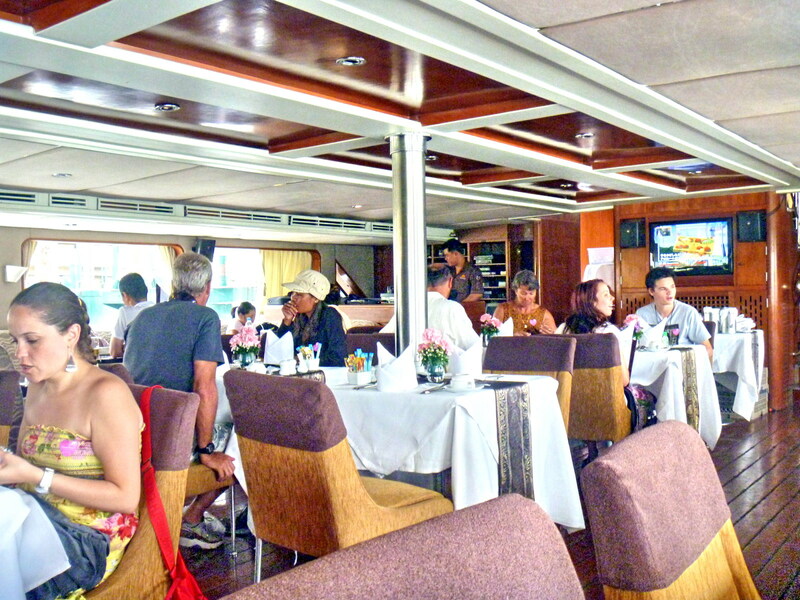 It is richly decorated in turn-of-the-century European aristocratic style, with quirky Thai touches here and there. Its audience chambers and anterooms are decorated with oil paintings, commissioned by King Chulalongkorn in 1888, depicting significant events in Thai history and scenes from Thai literature. The private apartments of this building are still used by the king and his family whenever they reside in the palace. Opposite the lake, to the east, is the 2-storey, elaborately-constructed Phra Thinang Utthayan Phumisathian (Garden of the Secured Land) Residential Hall, considered the principal building in the palace complex. Completed in 1877, this building was built from wood and decorated with mahogany furniture ordered directly from Europe. However, it was destroyed by fire during the restoration in 1938. Its modern reconstruction, tinted alternately in dark and light green, has a more “Paris Metro” Art-Deco feel to it. Its balcony is similar in design to that of a Swiss chalet. The building is still occasionally used by the royal family and is not open to the public. 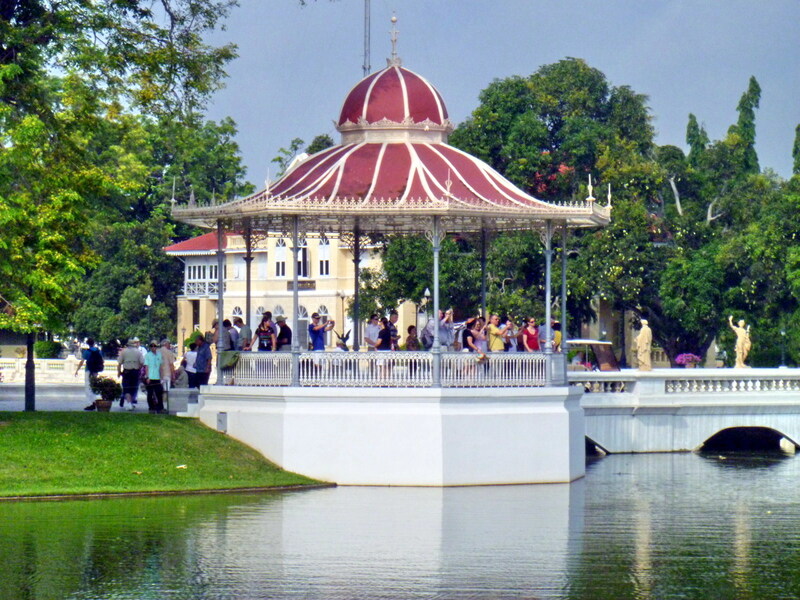 At the end of the promenade, the lake took on a more natural shape and, from a circular Spanish-style pavilion (Krajome Trae), we saw the “signature piece” of Bang Pa-In, the gracefully elegant Aisawan-Dhipaya-Asana Pavilion (The Divine Seat of Personal Freedom) in the middle of the lake. The only example of classical Thai architecture within the palace, it was built by King Chulalongkorn (Rama V) in 1876 and has 4 porches and a spired roof. From Krajome Trae, we fed the fishes with pieces from a previously paid for loaf of bread. Opposite the Krajome Trae is the Devaraj-Kunlai (The God King Goes Forth) Gate, the principal entrance to the Inner Palace. It is connected to the Varobhas Bimarn Mansion (located in the Outer Palace) by a covered bridge with a louvered wall from which the court ladies could look out without being seen themselves. The highlight of our visit was the opulent, Chinese-style Phra Thinang (Royal Residence) Wehart Chamrun (Heavenly Light), the only royal residence open to the public. Constructed in the Chinese Emperor style and made entirely of materials imported from China, it took 10 years to build and was completed in 1889. It was a royal offering to King Chulalongkorn (Rama V) by the Chinese Chamber of Commerce represented by Chinese merchant Phraya Choduk Ratchasetthi (Fak) as a token of the long-lasting brotherly relationship between the Thai and Chinese peoples. 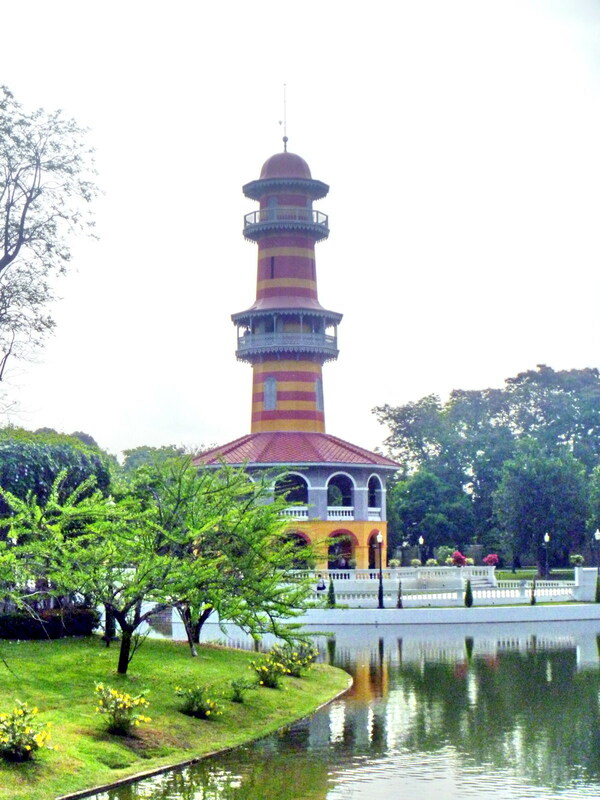 King Chulachomklao usually made a royal visit here during the cool season. Here, we had to remove your shoes to enter. 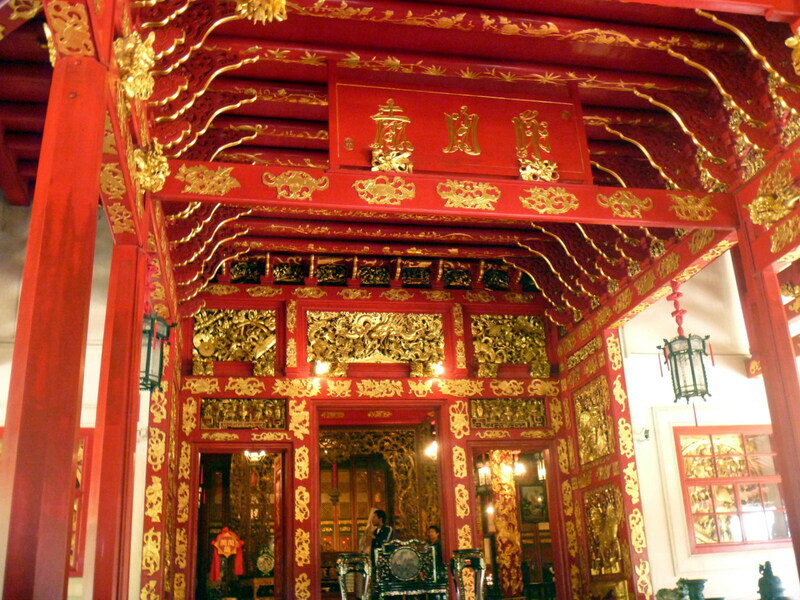 Full of red, gold, dark woods and inlaid mother of pearl, it has a stupendous dragon sculpture inside carved from camel bone and a Chinese-style throne room at the ground floor. the upper storey houses an altar enshrining the name plates of King Mongkut and King Chulalongkorn with their respective queens. Before returning, we climbed the 112-step spiral staircase up the 30 m. high, 3-storey and brightly painted Ho Withun Thasana (Sage’s Lookout), built in 1881, following in the footsteps of King Rama V who, when residing in Bang Pa-In Palace, used this hall as the place to get the bird’s eye view of the surrounding area. This hall was constructed in the form of a tower between Utthayan Phumisathian and Wehat Chamrun. Only the first two floors are open to the public. Back at the entrance, we returned the shirts and bought some soft drinks and snacks (10-20 baht) before boarding our bus. Bang Pa-In Palace: Bang Pa-In District, Ayutthaya, Thailand. Open daily, 8 AM-4 PM. While in the very heart of Bangkok’s main shopping and entertainment area, we took a nice respite from all this shopping by checking out Bangkok’s small but very vibrant contemporary art scene at the Bangkok Arts and Culture Center (BACC). The city’s latest effort to create an all-integrated art experience, it has several private art galleries plus non-museum operated designer boutiques, restaurants, the delightful IceDEA (the innovative ice cream design store), coffee shops, music studios, multipurpose room, etc., on the first 3 floors, and main galleries, meeting rooms, projector rooms for movies, and a theater on the upper floors. 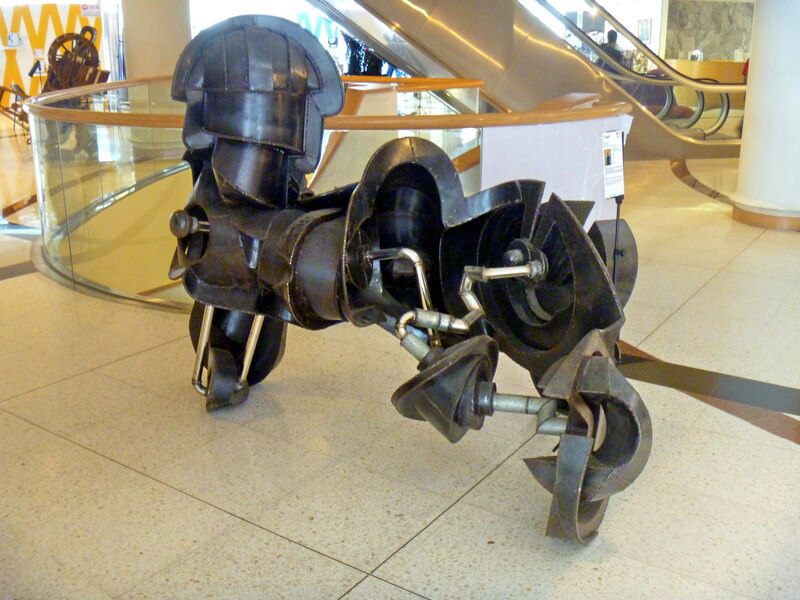 Mimicking New York’s Guggenheim Museum, artwork is also on display along the spiral walkway. There is an art library, with 6,000 books, in the basement. This 438 million baht, massive, 25,000 sq. 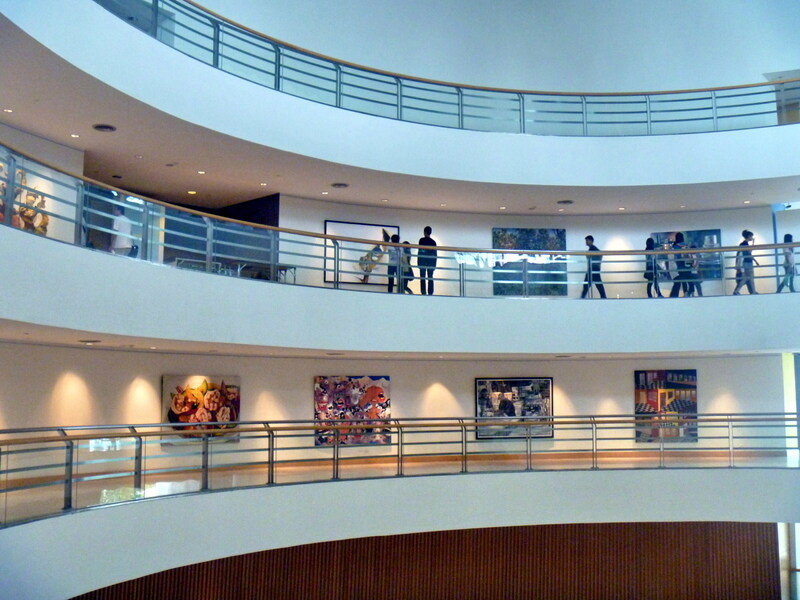 m. contemporary art museum, originally named Bangkok Metropolitan Museum of Contemporary Art (BMOCA), was started in 2000, later halted due to funding problems and alleged corruption, restarted in 2005, and renamed Bangkok Art and Culture Center before its opening on July 28, 2008. Here, we can interact with a range of creative mediums (films, conceptual photography, theater, sculpture, fine arts, etc.) on a number of different levels. Some of the collections on display are permanent pieces of the center while others are rotated or are temporary. The building was designed to allow just enough light to illuminate the interior’s 10 floors without damaging the collections. 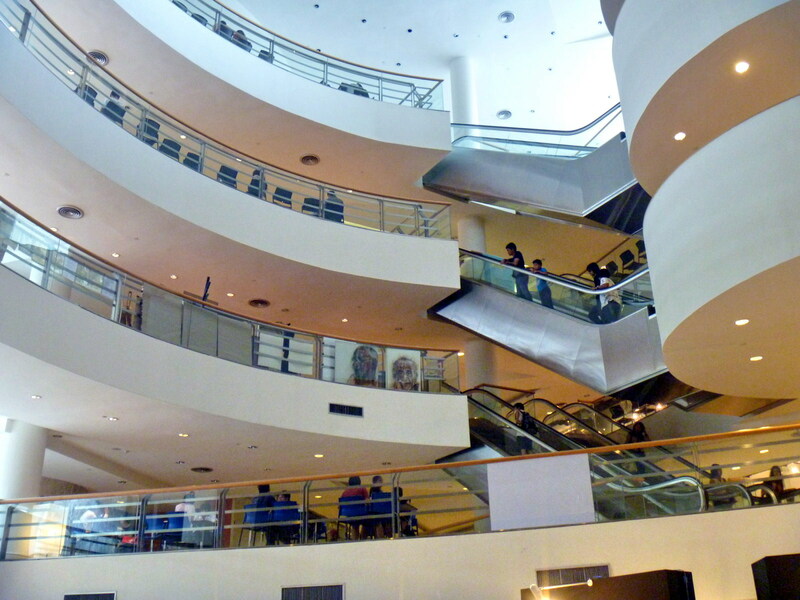 After our museum visit, we left BACC, via the bridgeway, for the MBK (Mah Boon Krong) Mall. The museum is also near the Siam Discovery Center and is easily accessible from the National Stadium and Siam BTS Skytrain stations. 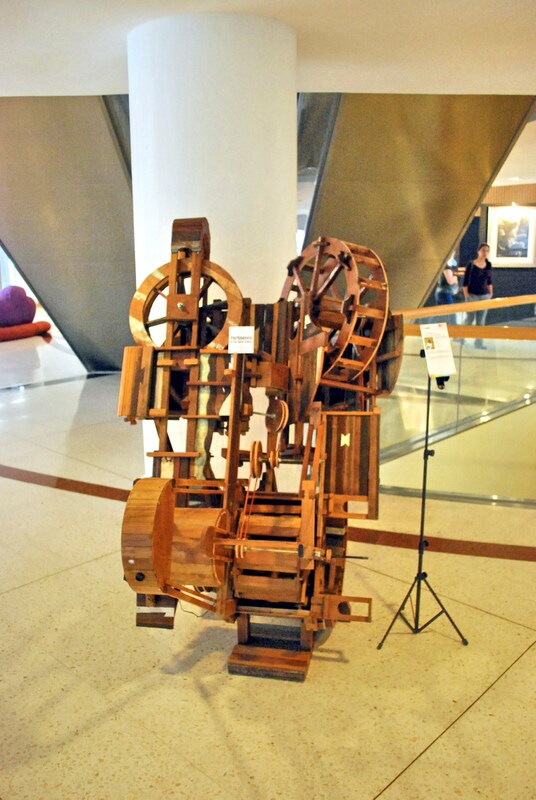 Bangkok Arts and Culture Center: 939 Rama 1 Road, Wangmai, Pathumwan, Bangkok 10330, Thailand. Tel: +66 02 214 6630-1. Fax: +66 02 214 6632. E-mail: bkkart@yahoo.com. Website: www.bacc.or.th. Open Tuesdays-Sundays, 10 AM-9 PM. Admission is free. 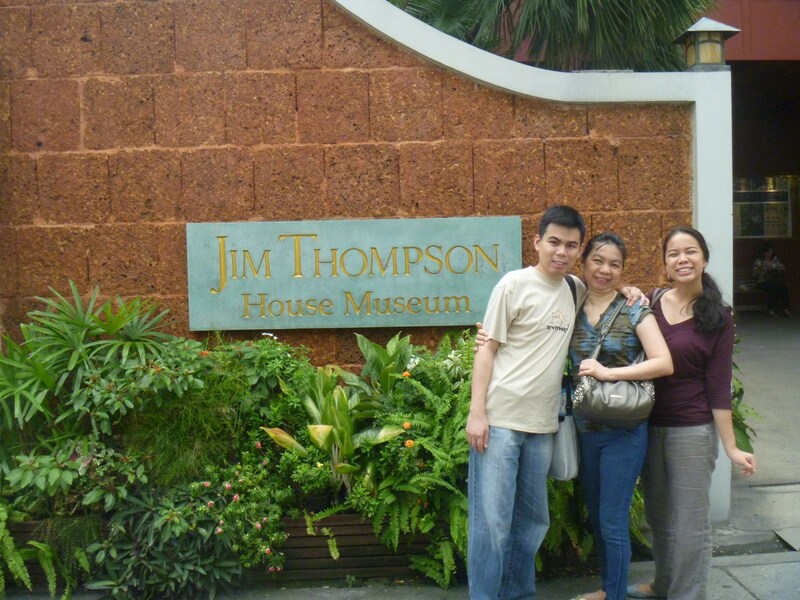 After our Bangkok city tour, we asked our guide to to drop us off at Jim Thompson’s House, another of the city’s popular tourist destinations. We alighted at a non-descript lane, at the end of which was the entrance of the Jim Thompson House, standing on 1 rai (about half an acre) of land beside Klong Maha Nag and enveloped by verdant and beautifully landscaped gardens. Its jungle landscape (palm trees, ficus, flowering bananas, the flame of the forest, golden bamboo, rain trees and a myriad of other flowering and non-flowering plants, shrubs and bushes), in the midst of the city, gives the house its unique appeal. 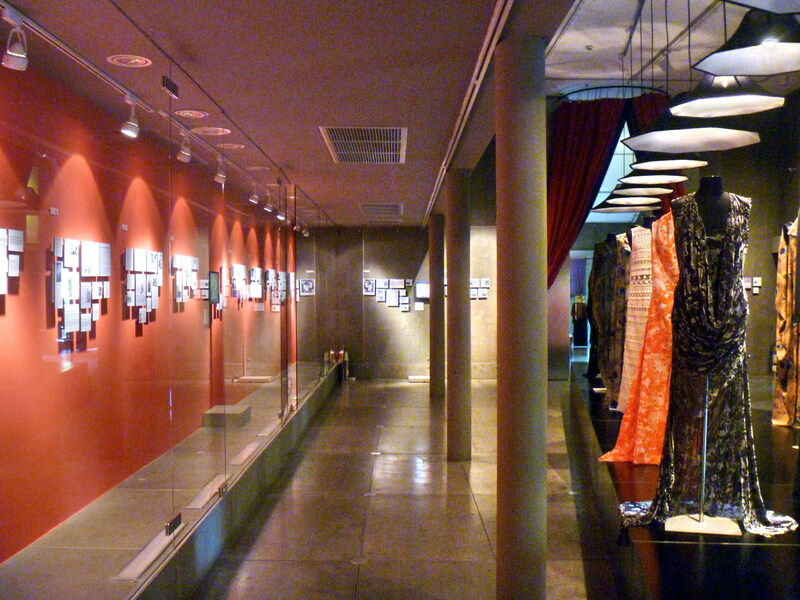 Upon entering, we first paid the entrance fee and decided to view an exhibit of Thai silk at the Jim Thompson Art Center. The art center also had a running video presentation of the life of Jim Thompson which we viewed. Self-made American entrepreneur James Harrison Wilson Thompson, born in Greenville, Delaware in 1906, studied architecture at the University of Pennsylvania and was a practicing architect in New York City until 1940. During the Second World War, Thompson was assigned to the Office of Strategic Services (OSS), the forerunner of the Central Intelligence Agency (CIA), a move which offered him an opportunity to see more of the world. In 1946, he assumed the duties of OSS station chief in Thailand and had developed a certain fondness for the country and its people. He later settled down in Bangkok and went into business in Thailand, founding the world renowned Jim Thompson Thai Silk Company. Jim mysteriously disappeared in the jungles of the Cameron Highlands in Malaysia in 1967 while on an Easter weekend holiday with friends. After our visit to the art center, we decided to have lunch at its coffee shop and check out the souvenir shop. We then availed of a guided tour of his charming complex of six traditional Thai-style, teak houses as well as its showcase collection of Southeast Asian objets d’art. Before doing so, we were required to leave our bags in lockers to prevent their knocking off many of the valuable antiques in the house. We were also not allowed to take pictures inside the house. The teak structures were purchased by Jim from several owners from various parts of Thailand, knocked down, brought to the site, re-assembled again and completed in 1959. The house’s supporting columns and walls lean slightly inward, adding to the illusion of height and grace. The relatively few, purely decorative elements are largely confined to panels carved in Chinese designs under the windows and sometimes over the doors, and the curved, stylized ends of the steep roof (characteristic of traditional Thai houses), probably adaptations of naga (serpent) motifs that adorn Khmer temples. The houses are elevated to facilitate the circulation of air, offer a more comfortable living space and protect the home from the risk of floods, in the monsoon season, as well as from hostile wildlife. The open space was also used as a living area in the hot season, as storage for the season’s harvest, and as a place to keep livestock. There were a great number of windows and doors, all carefully aligned to facilitate an uninterrupted flow and aid the circulation of air. The walls, though generally left unpainted, were sometimes oiled. The broad overhangs of its roof protect the interior from both sun and rain. 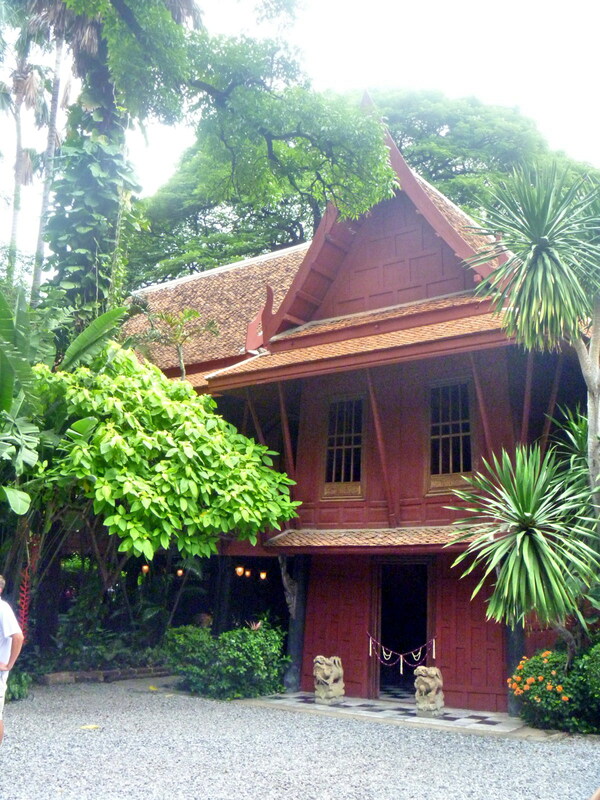 Jim Thompson House: 6 Soi Kasemsan 2, Rama 1 Road, Bangkok, Thailand. Tel: (662) 216-7368 Fax: (662) 612-3744. Open daily, 9 AM-5 PM. Last guided tour at 5 PM. Website: www.jimthompsonhouse.com. 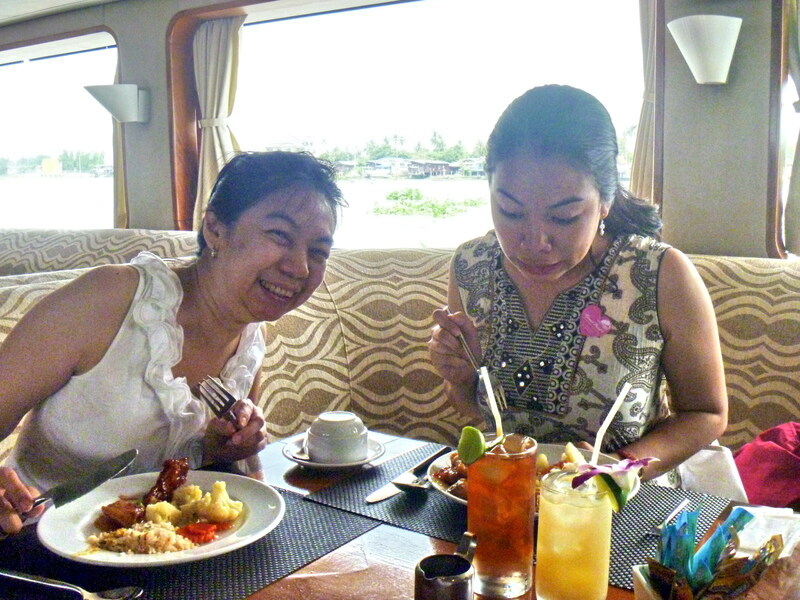 After our short visit to Wat Traimit, we all returned to our van and moved on to our next stop, the 80,000-sq. m. (20-acre) Wat Pho (Wat Phra Chetuphon Vimolmangklararm Rajwaramahaviharn), the largest in Bangkok and, technically, the oldest wat, being built around 200 years before Bangkok became Thailand’s capital. 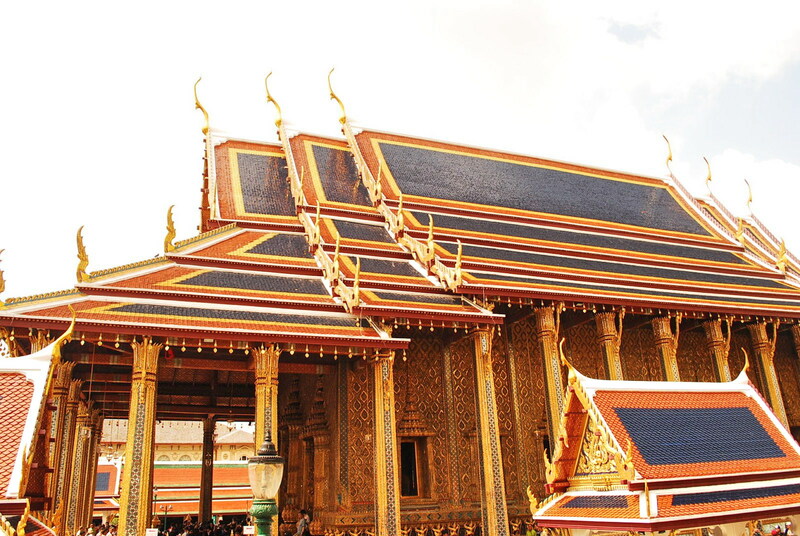 However, the present temple bears virtually no resemblance to its original structure as it was almost entirely rebuilt by King Rama I when the capital was moved to Bangkok. 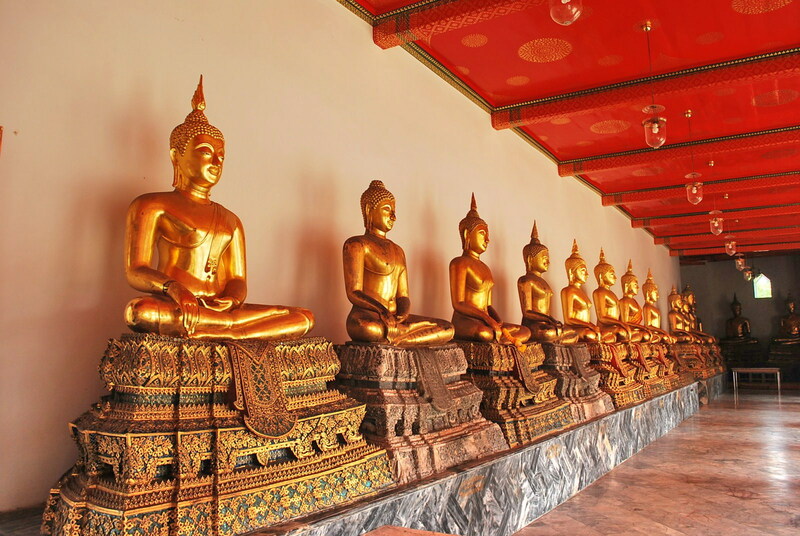 Wat Pho also holds the dual honors of having Thailand’s largest reclining Buddha image and having the most number of Buddha images. The temple complex, with more than 20 buildings and structures, is walled in on 4 sides with entrances at each side. We entered the complex via the entrance at Chetuphon Road which splits the grounds of the temple into 2, the northern section generally being the only one most people go to. 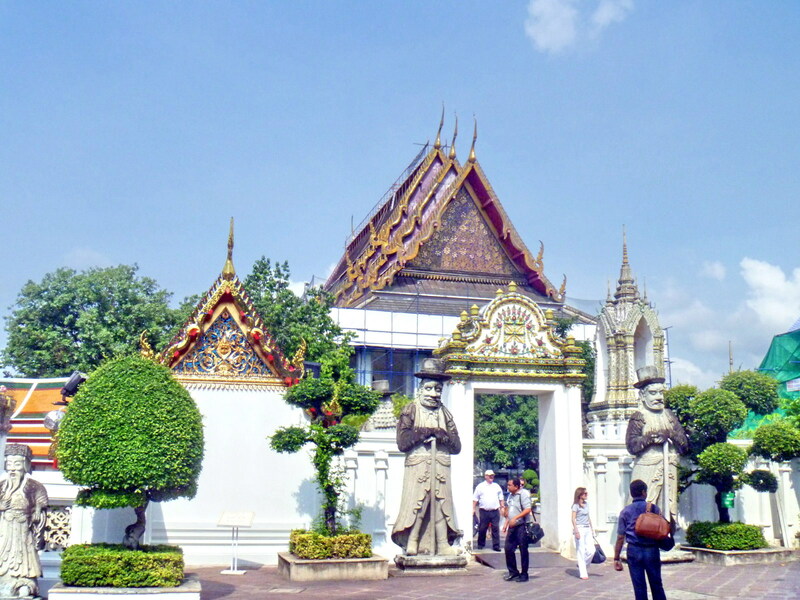 Standing on both sides of the sheltered entrance gate are the gate guardians lan than nai tvarapala, fierce-face Thai-Chinese style rock giants wearing a tight suit of armor and holding a weapon in one hand. Several Chinese statues also line the outside of temple buildings, a reflection of the Chinese influence during the reign of King Rama III. 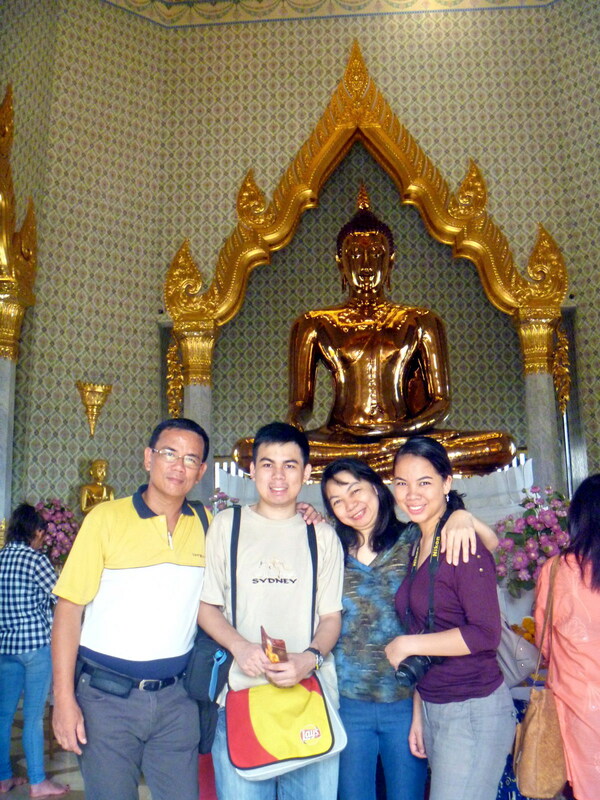 After paying the admission fee, we first visited the Vihara of the Reclining Buddha or Phra Buddhasaiyas (Viharn Phranorn). We had to remove our shoes and sandals before doing so. 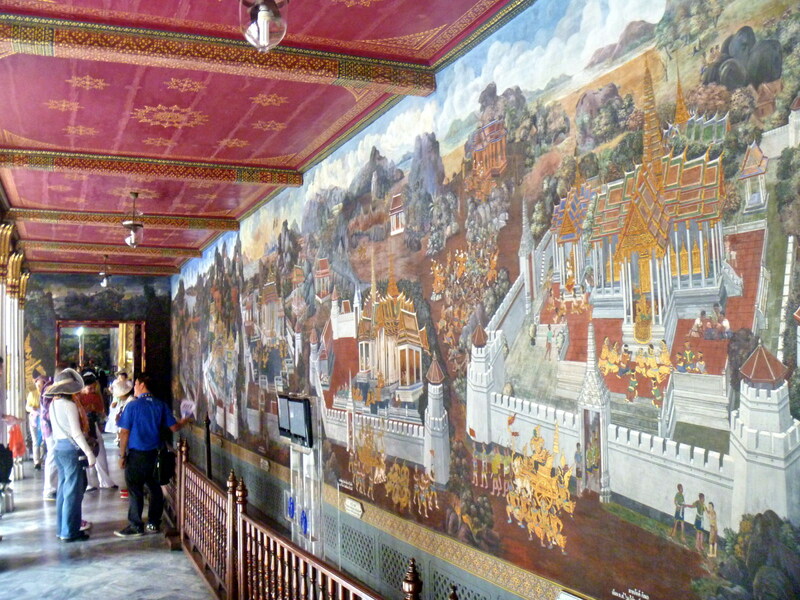 The inner wall of this vihara is decorated of the mural paintings of “Mahawong” (Historical annals of Ceylon) above the windows; and the “13 Savida Atadagga Disciples (Priestess),” “10 Upasaka Atadagga Disciples” and “10 Upasika Atadagga Disciples” between each window. 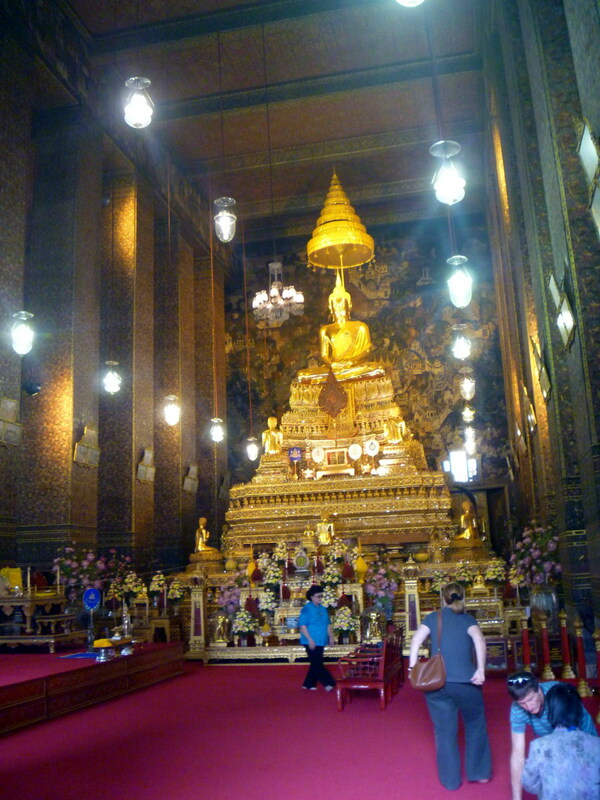 Inside, we were highly impressed by the gold-plated Reclining Buddha (Phra Buddhasaiyas), made of stuccoed bricks gilded with gold leaves and designed to illustrate the passing of the Buddha into nirvana. Its dimensions were indeed huge, being 46 m. long and 15 m. high. The soles of the 3 m. wide and 5 m. long feet and the eyes are exquisitely engraved with mother-of-pearl decoration of 108 auspicious lakshanas (characteristics) of the true Buddha. 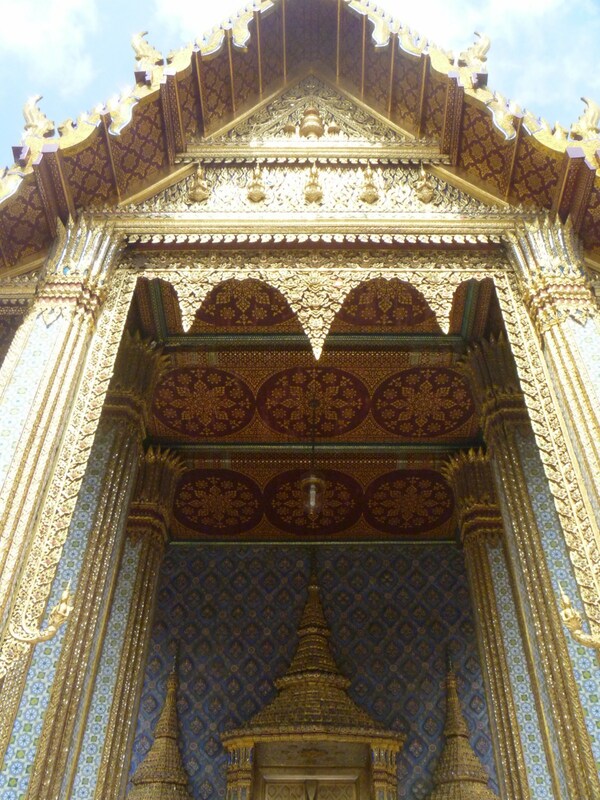 We also visited the Phra Uposatha, the ubosot (main chapel or assembly hall) and the heart of the temple. It was built, in Ayutthaya style, during the reign of King Rama I and reconstructed and enlarged during the reign of King Rama III. All the hardwood windows and doors have crown–like spires and colored glazed tiles. Double marble boundary walls (kampaengkaew), surrounding the main chapel, have 8 sheltered gates and 8 sculpted boundary stones (bai sema). The outer side of the kampaengkaew is decorated with carved stones portraying natural scenes of mountains, trees and animals. Inlays of mother–of–pearl, on the outer side of the entrance door panels, depict episodes from the Ramakien (the Thai version of the world famous Ramayana Indian epic) while, on the inner side, are painted specimens of ecclesiastical fans of rank which are presented to the monk sovereigns. It is enclosed by 394 bronze Buddha images. Outside the ubosot, there are 152 marble slabs depicting the second half of the epic Ramakian story. Inside is the Phra Buddha Deva Patimakorn, a seated Buddha image on a 3-tiered pedestal called Phra Pang Smadha (Lord Buddha in the posture of concentration). 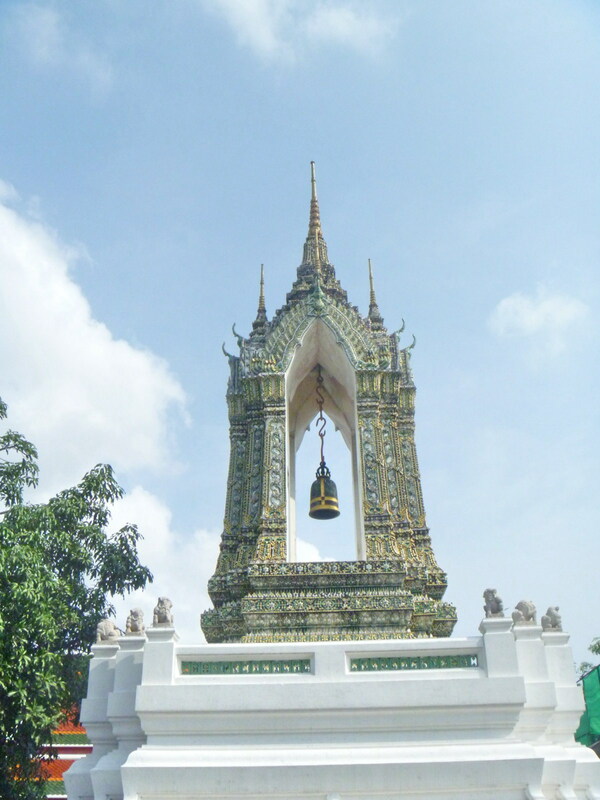 Some of the ashes of King Rama I are kept under the pedestal. 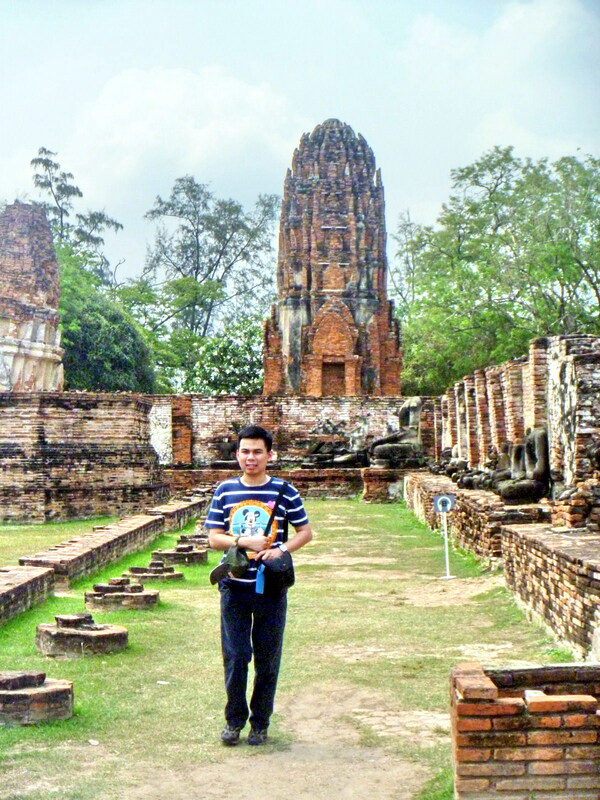 We also took time to explore the large grounds of the temple which contains more than 1000 Buddha images, most taken from the ruins of deserted temples of the former capitals of Ayutthaya and Sukhothai. 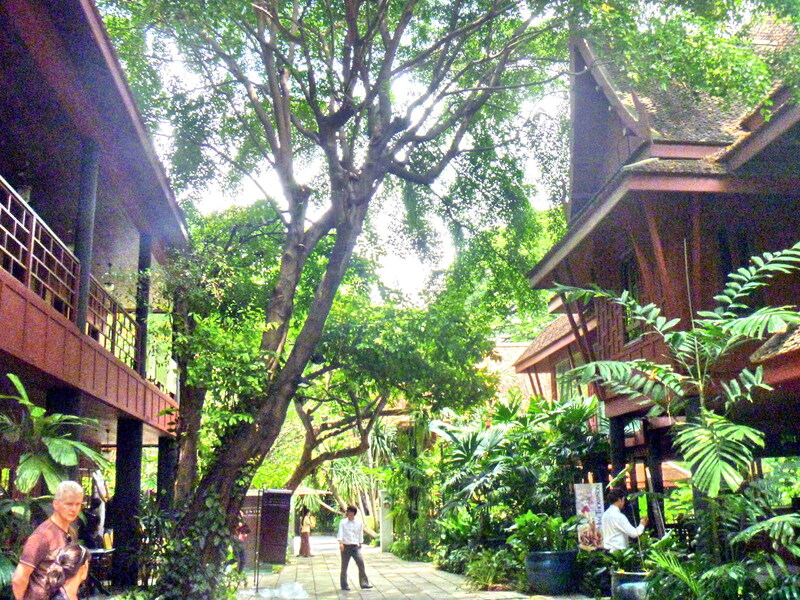 The Phra Rabiang is a double cloister surrounding the courtyard of the chapel. Connected by 4 main direction viharas, its gallery is lined with hundreds of Buddha images. 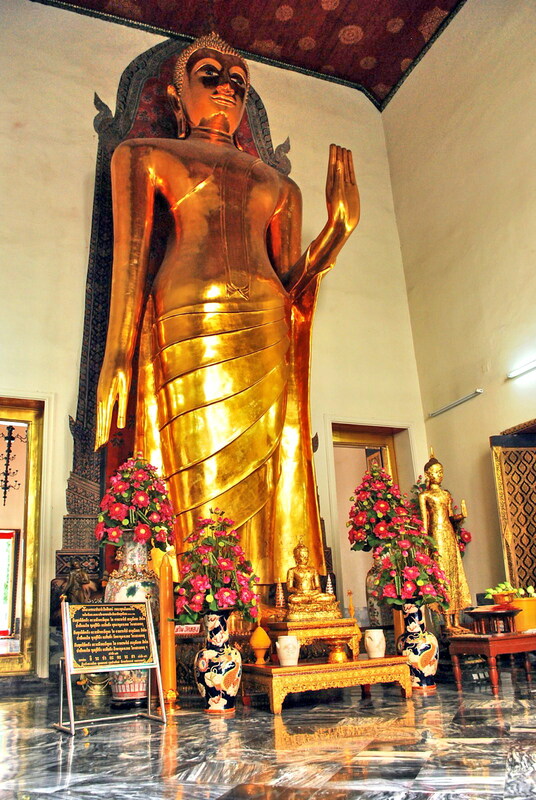 The image of Pang Marnvichai (Enlightened Lord Buddha under the Bodhi Tree) and the 10 m. high bronze Buddha image, Pra Buddha Lokanart Satsadajarn, which was brought from Wat Phra Sri Sanpej in Ayutthaya, is in the East Vihara. The inscription of Wat Pho’s establishment is also kept here. The image of “Lord Buddha Preaching the First Sermon to the Five Disciples” is in the South Vihara, the image of Phra Paleylai in the North Vihara and the image of Pang Nak Prok (Buddha Under the Naga’s Hood) in the West Vihara. The inner side cloister contains 150 Buddha images while another 244 images are located on the outer side, all brought from the northern provinces during the reign of King Rama I. Today, all Buddha images are covered with gold leaves and provided with large glass frames to protect them from birds, bats and dirt. Posted on all columns along the cloister are Thai prosody framed in 100 stone inscriptions by the order of King Rama III. 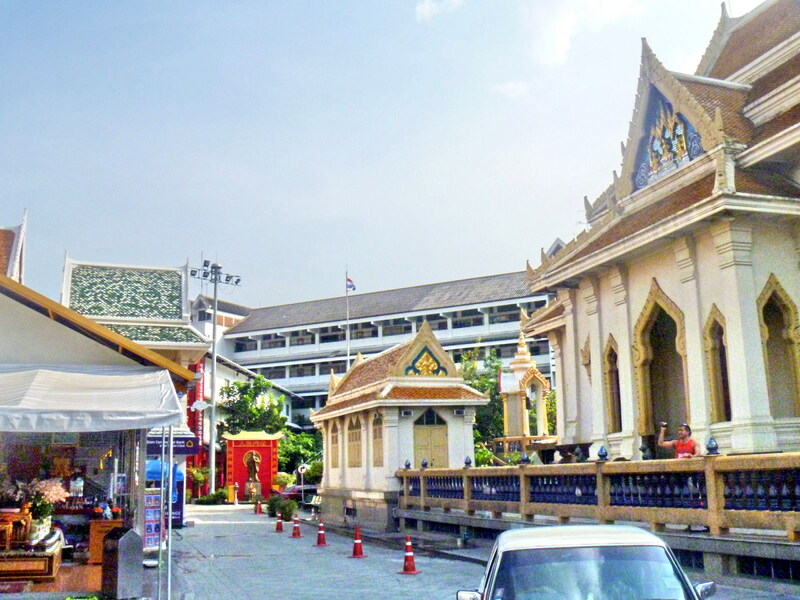 Nearby is the Phra Mondob (Scripture Hall), built during the reign of King Rama III. 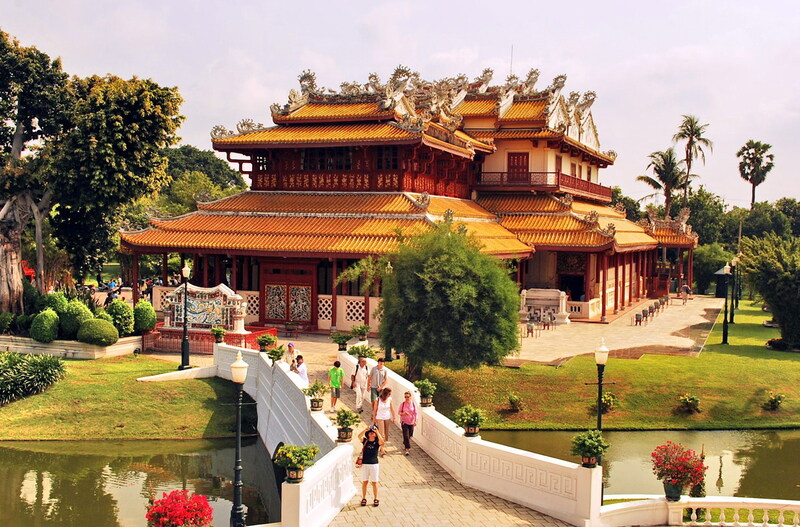 It is walled in and has displays of Buddha statues, old ceramics and glassware, tripitaka (teachings of Buddha) and traditional Thai books written on palm leaf manuscripts. It is crowned with a gabled tetrahedron decorated with multicolored Chinese ceramic bowls. There are porticoes at the 3 directions of the Mondob. The library is also impressively decorated with figures and pagodas made of porcelain, in much the same way as Wat Arun, across the Chao Phraya River. Also near here is the Phra Maha Chedi Si Rajakarn, a group of 4 huge, 42 m. high chedis (round pagodas), constructed to honor the reigns of the first 3 Chakri kings (2 for King Rama III): King Rama I (Phra Maha Chedi Sri Sanpetdayarn, green), King Rama II (Phra Maha Chedi Dilok Dhammakaroknitarn, white), King Rama III (Phra Maha Chedi Muni Batborikharn, yellow) and King Rama IV ( Phra Maha Chedi Song Phra Srisuriyothai, dark blue). Also around the grounds are 91 massive chedis, of varying sizes, along with chapels, rock gardens, an array of different types of statues, inscriptions, bell towers and resident fortune tellers. 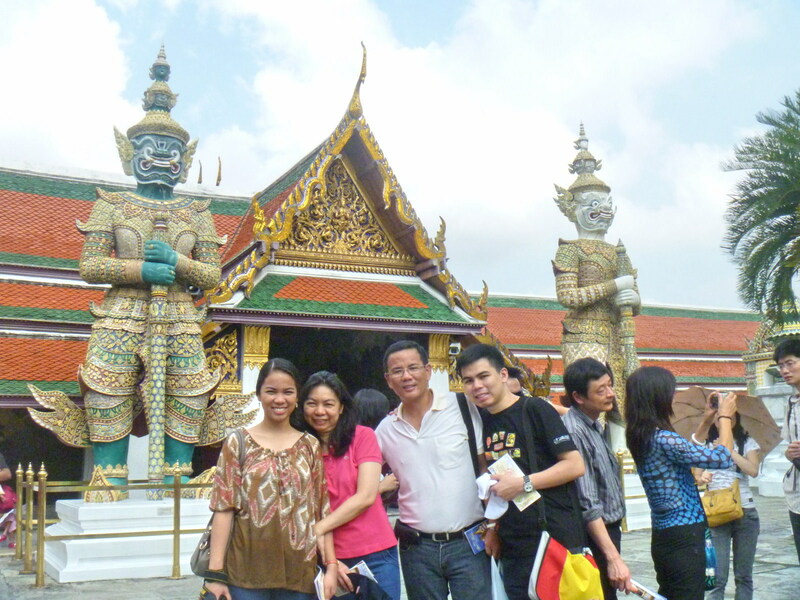 Wat Pho: Chetuphon Rd., Phra Nakhon (Rattanakosin) District, Bangkok, Thailand.Tel: 662-226-0335 and 662-226-0369. Open daily, 8 AM-5 PM. 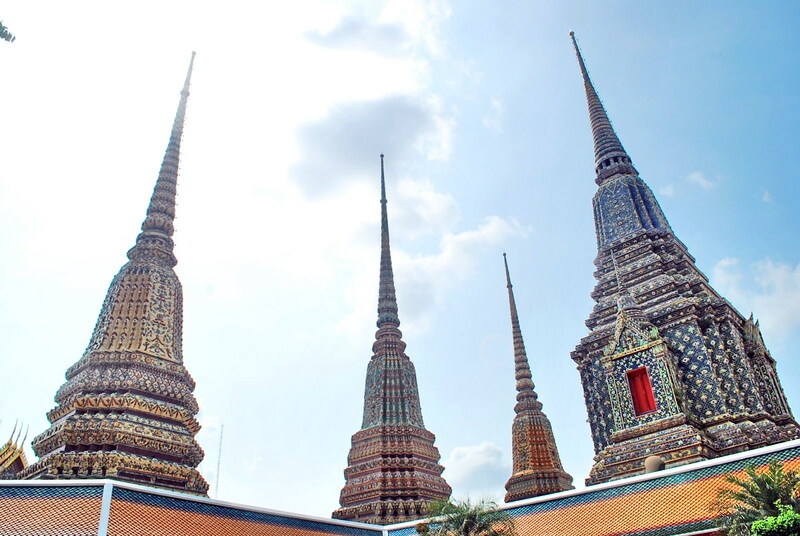 How to Get There: airconditioned buses 6, 8 and 12 all stop near Wat Pho. 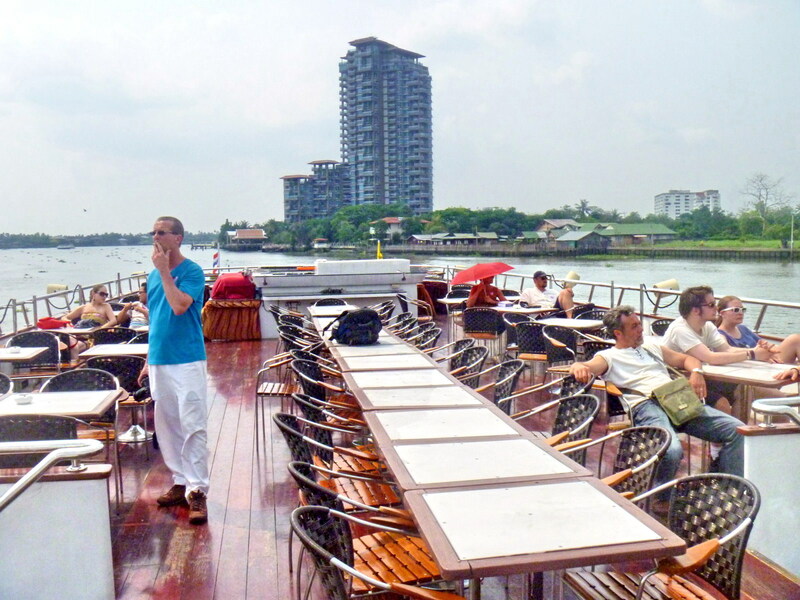 The Tha Tien express boat pier is also very near. Ordinary buses 1, 25, 44, 47, 62 and 91 stop along Maharat Rd. ; and bus 44, 47 and 91 along Thaiwang Rd. 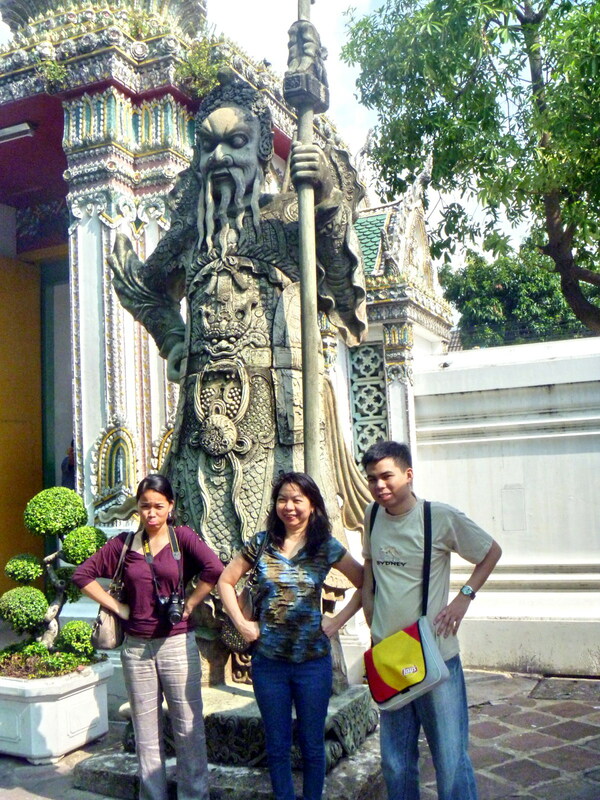 on the north side of Wat Pho, south of Wat Phra Kaew. 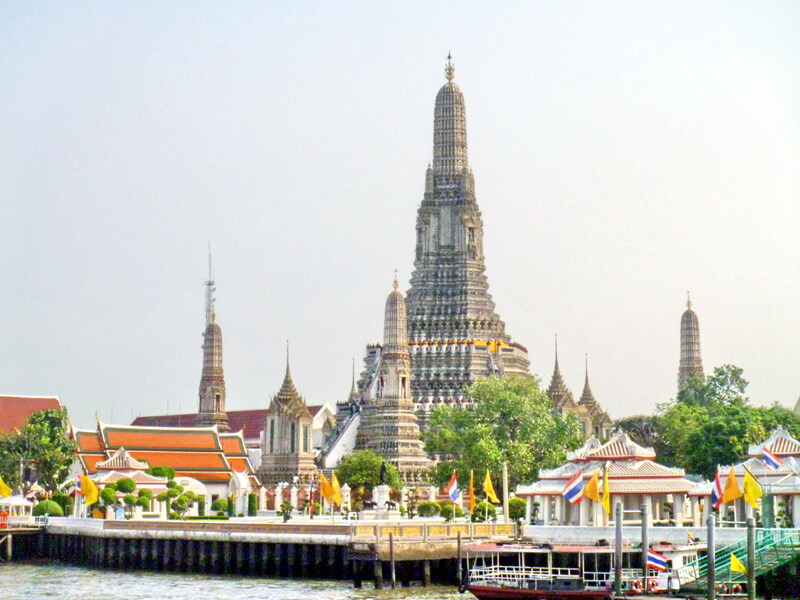 Wat Pho is also just a short river crossing away from Wat Arun. The next day, we were scheduled for our half day city tour. After breakfast at the hotel, we were picked up by our Thai lady guide at the hotel lobby and we boarded our tourist van at the driveway. 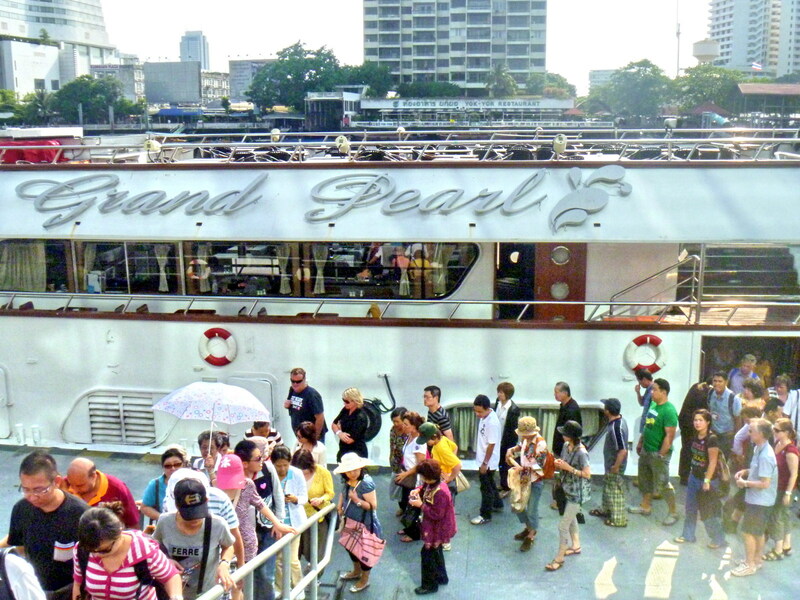 Our first stop, at the end of Chinatown’s Yaowarat Rd. 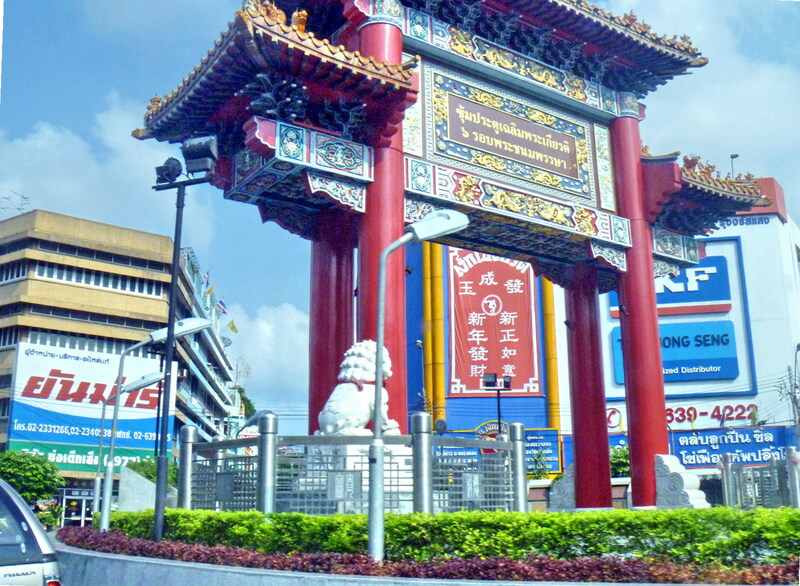 (near Hualampong Railway Station), past the Odeon Circle (dominated by the huge, symbolic Chinese gate), is the relatively plain looking Wat Traimit, the Temple of the Golden Buddha. This was the second such visit for me and Grace and a first for Jandy and Cheska. 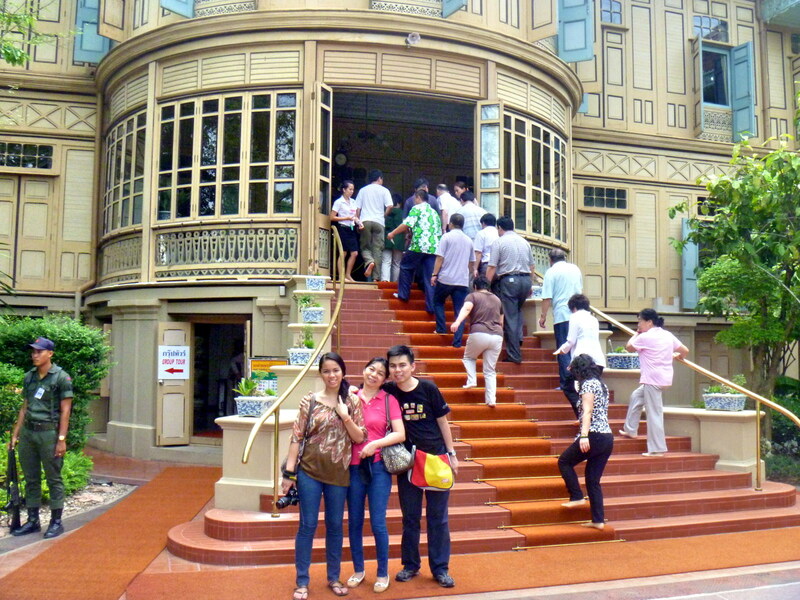 After paying the 40 baht admission fee for the4 of us, we climbed a flight of steps to get to the third level of its impressive chapel which was just opened last year (February 14, 2010). Here, perched high atop a 4-storey, marble-clad ziggurat and in the mara conquering attitude, is the 5.5-ton, 10-ft. (15.75 ft. from the base to the top of the crown) high Golden Buddha, the largest, solid gold (about 83%) Buddha image in the world. On the second level of the chapel is a museum on the history of the Golden Buddha and the method of casting golden Buddha statues. 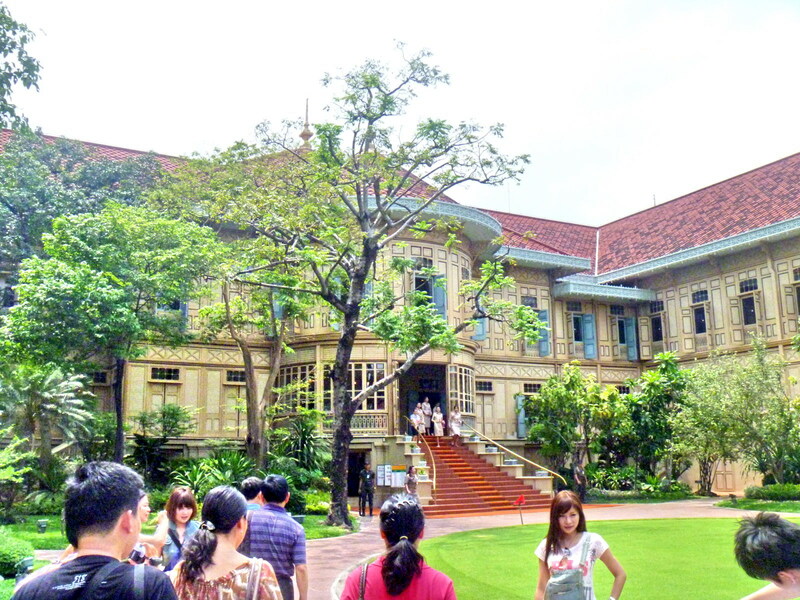 The first level houses the Yaowarat Chinatown Heritage Center which preserves the history of the Chinese immigrants in Bangkok and Thailand. 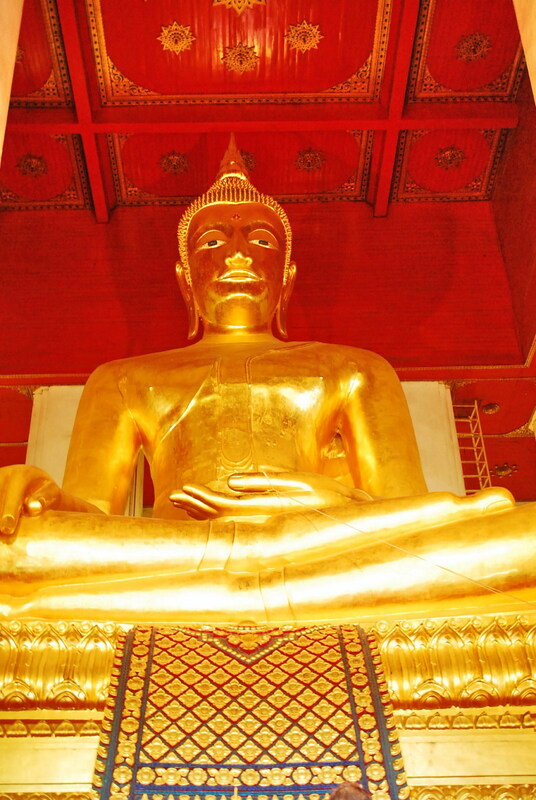 The Golden Buddha, an excellent example of the gracious Sukhothai style, has an unusual and colorful history. It was cast sometime in the 13th century and was, at some point, covered in plaster lacquer and stucco to hide the valuable icon from the besieging Burmese. Apparently everyone forgot about what was hidden beneath. A member of King Rama III’s court had the statue moved to Bangkok and installed inWat Phraya Krai along Charoen Krung Rd., Yannawa district near the Taksin Bridge and where the Mandarin Oriental Hotel is today. That temple fell into disuse, was completely abandoned around 1931 and demolished in 1957. In 1955, when the image was being hoisted by a crane to its present location at into its new home at Wat Traimit, the cable broke, dropping the statue into the mud and chipping off some of the plaster, thus revealing the gold underneath. Bits of the plaster as well as the old pulley and rope used to hoist the Buddha are on display in the interpretive center below the chapel. Wat Traimit: Traimit Rd., Samphanthawong District, Chinatown, Bangkok, Thailand. Tel : 0 2225 9775. Open daily, 9 AM-5 PM. How to Get There: Take the Metro to Hua Lamphong MRT Station. From there, the temple is just 300 m. away. You can also take Bus No. 4, 7, 21, 25 and 501.